From Hank Williams to Johnny Cash. From Bill Haley to John Lennon. 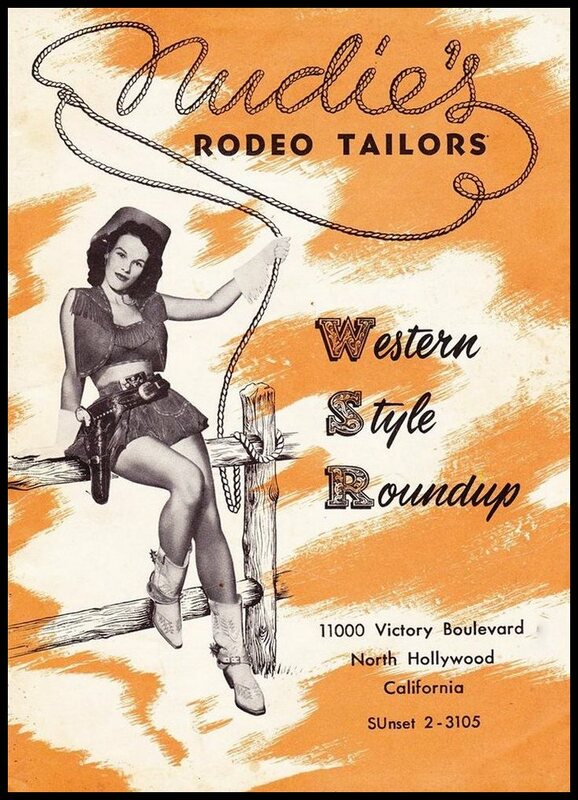 From Roy Rogers to John Wayne. And from Pablo Picasso to President Reagan. 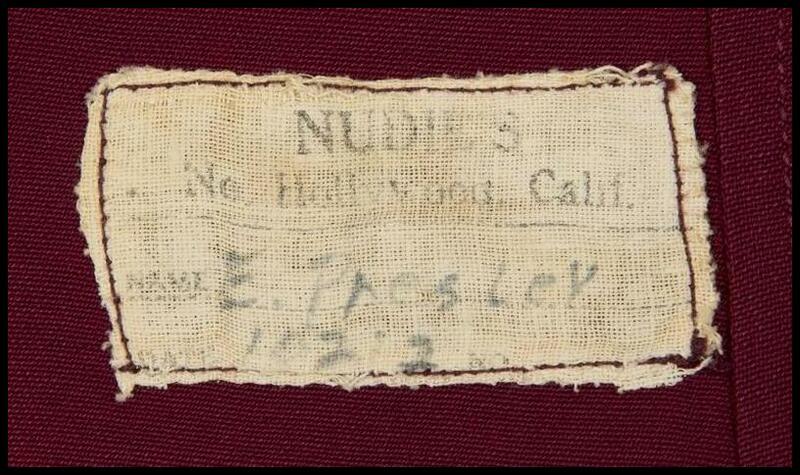 Everybody who was somebody, and also every nobody who wanted to be a somebody, seemed to wear a Nudie piece of clothing! In the following article we will focus on the impact and importance of the Gold Suit. We will do so by chronicalizing the connection between Nudie Cohn and Elvis Presley through the years. 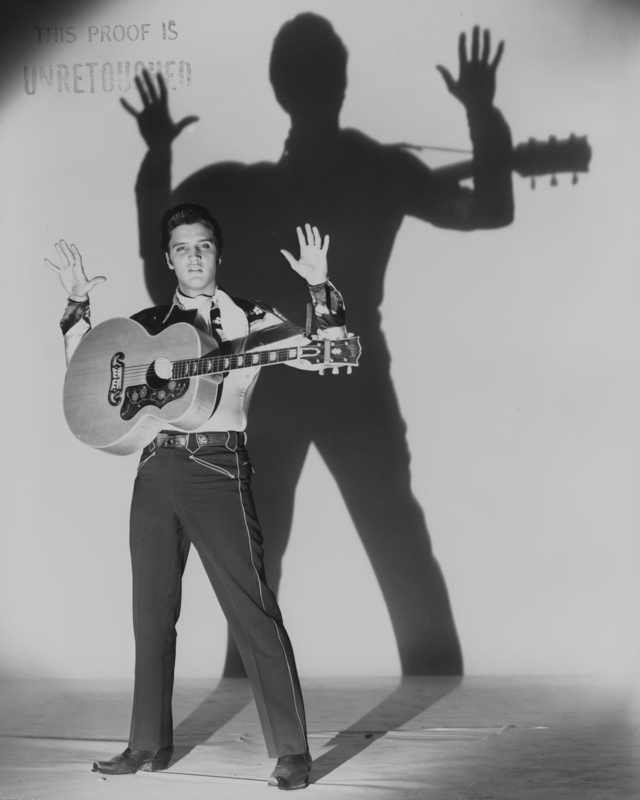 The photographs that exist of the two, as well as photos of the clothes Nudie designed for Elvis, will guide us through their unique collaboration. 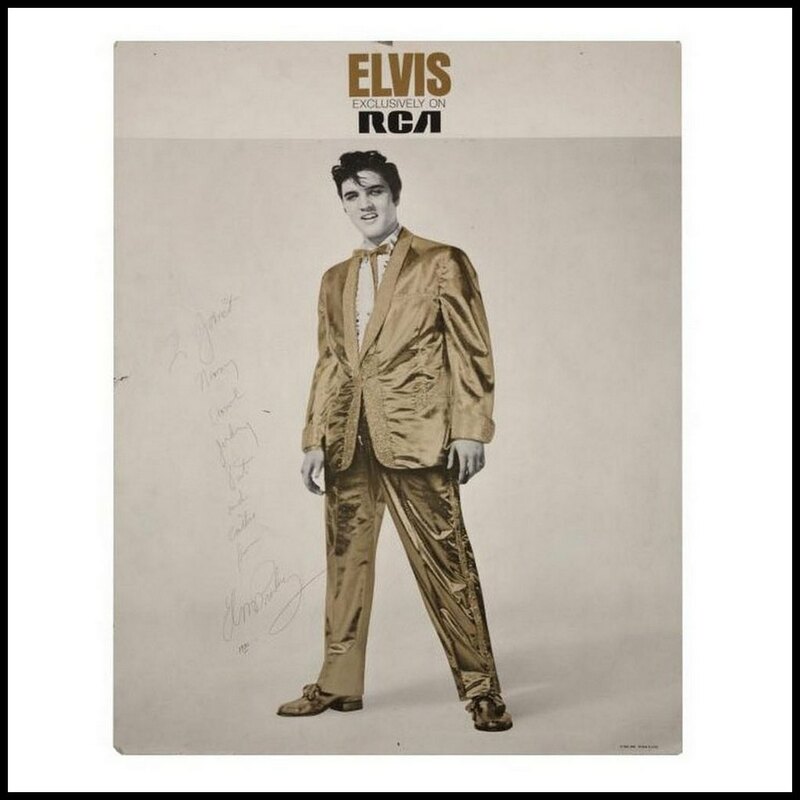 The second part of this article consists of all sorts of vintage (promotional) stuff from RCA that feature the image of Elvis in his Gold Suit. 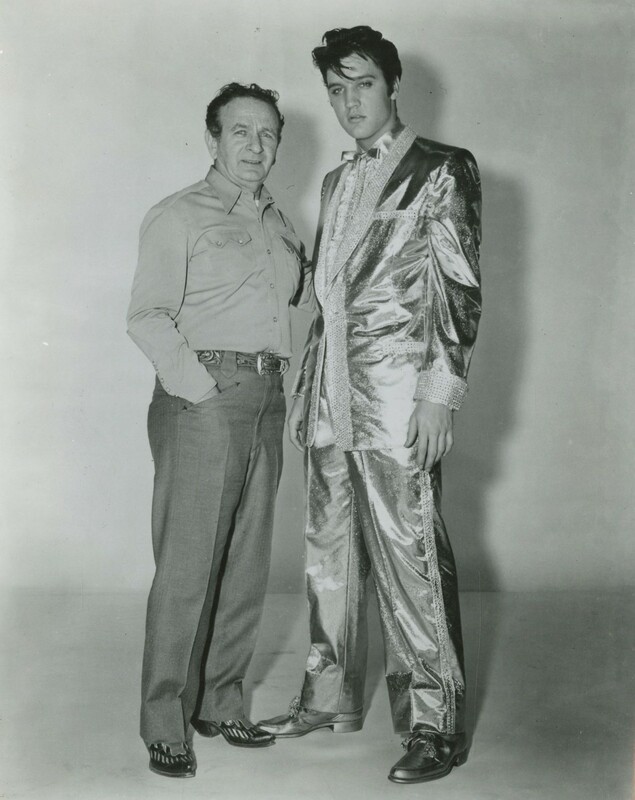 In the photo below we see Elvis meeting Nudie Cohn. 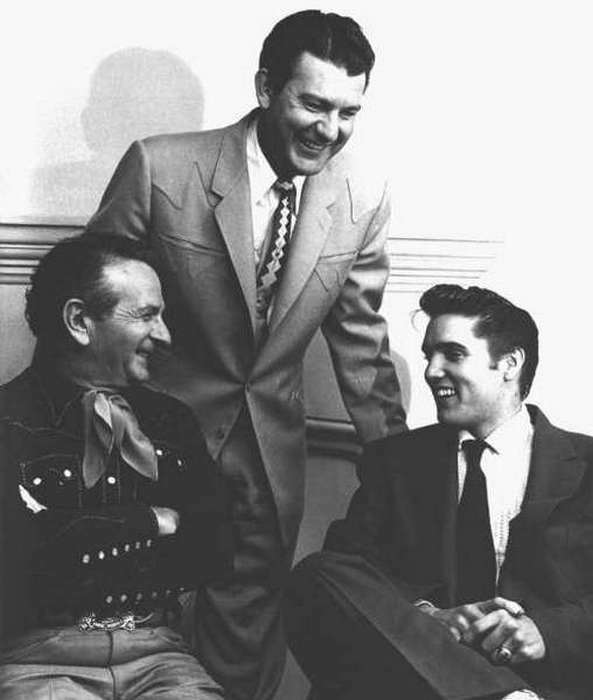 Countrysinger Tex Williams is the man in the middle. The image to the left has not often been seen. 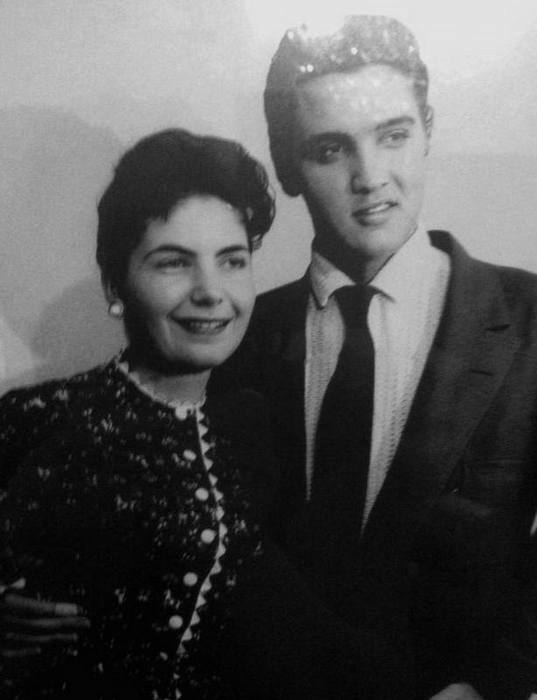 It was taken during the same meeting and shows us Elvis with Nudie’s daughter Barbara Cohn. 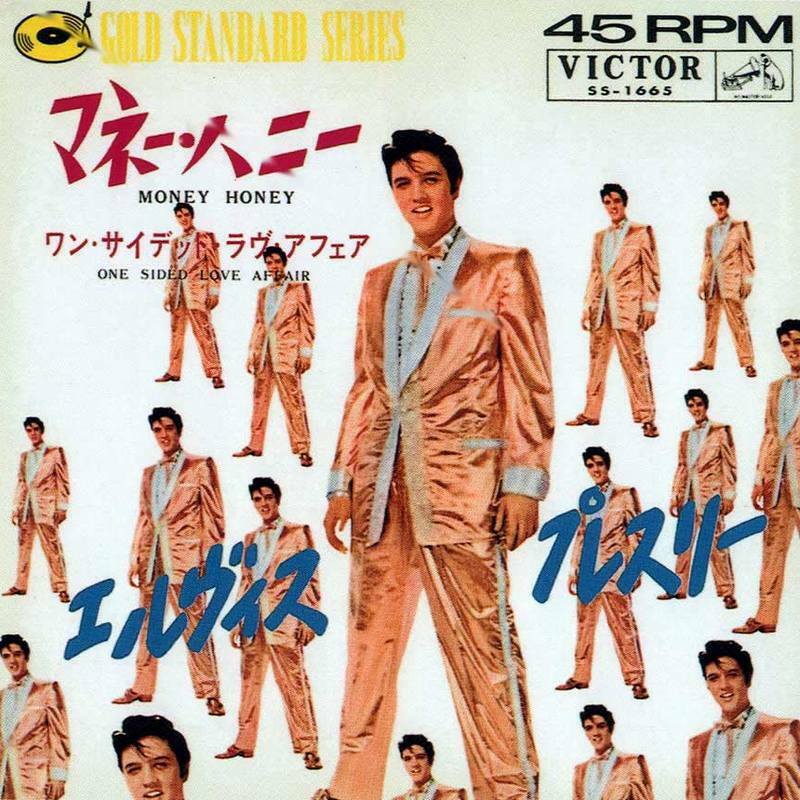 Elvis Presley in the company of recording artists who are dressed in a Nudie Cohn creation. 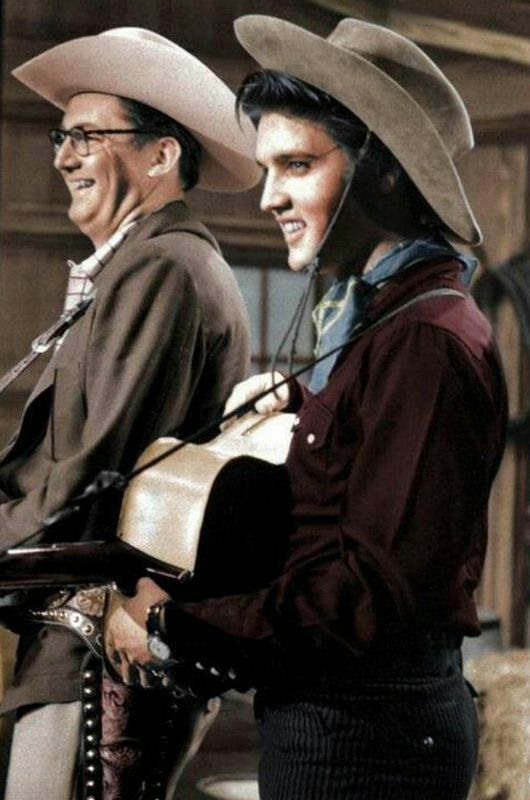 The first time Elvis wore a piece of clothing that carried the famous Nudie label, was on The Steve Allen Show (July 1, 1956) when he was dressed in a red WESTERN SHIRT during the comedy routine. This very cool shirt was up for auction in 2014 with an estimated selling price of $15.000 / 20.000, but it remained unsold. A letter from Nudie Cohn to Colonel Parker. The first thing that captures the eye is that the letter is dated on the same day the historical Million Dollar Quartet took place at Sun Studios in Memphis: December 4, 1956. Sheer coincidence of course, but rather interesting nonetheless. 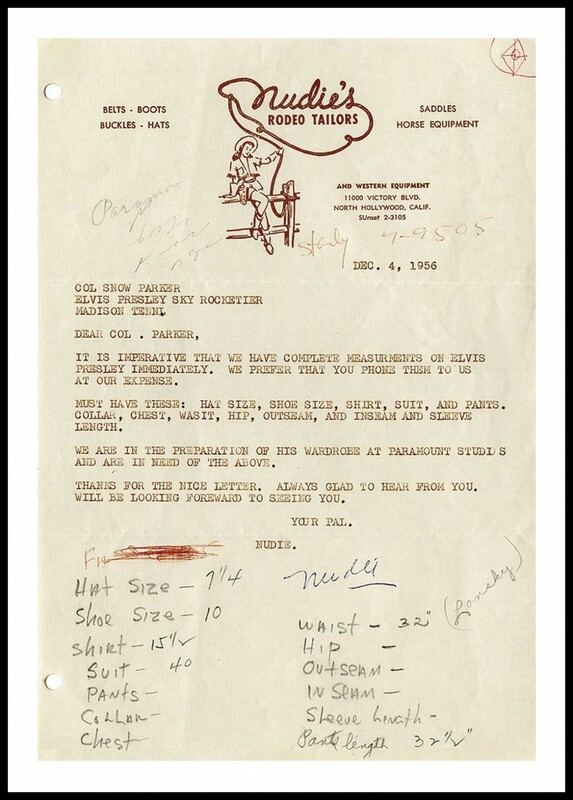 The letter is an immediate request for Elvis’ measurements as Nudie was preparing Elvis’ wardrobe for the upcoming movie Loving You. The first is a reference to Parker’s Snowman’s League of America. 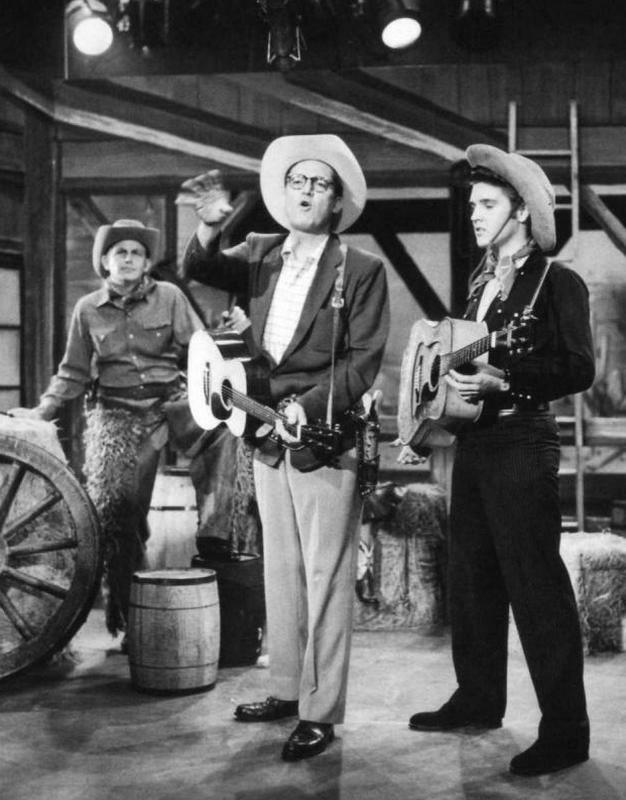 And the second remark leaves no doubt that in Nudie’s believe, the Colonel was responsible for skyrocketing Elvis’ career. 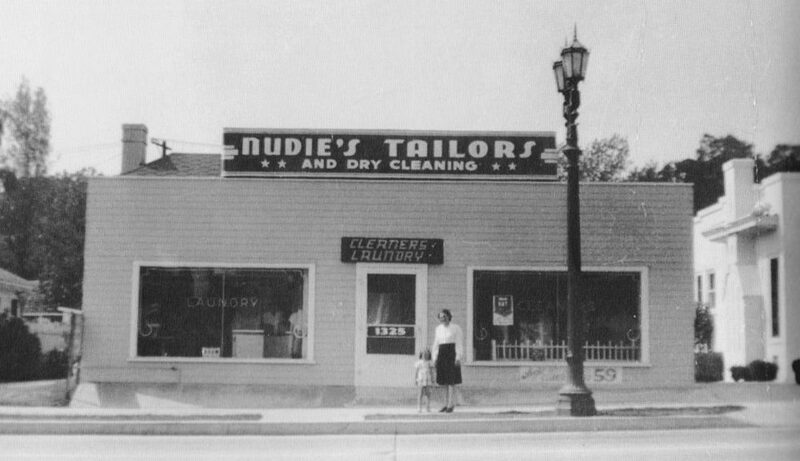 Below we have a (small) photo of Nudie and Tom in 1965. 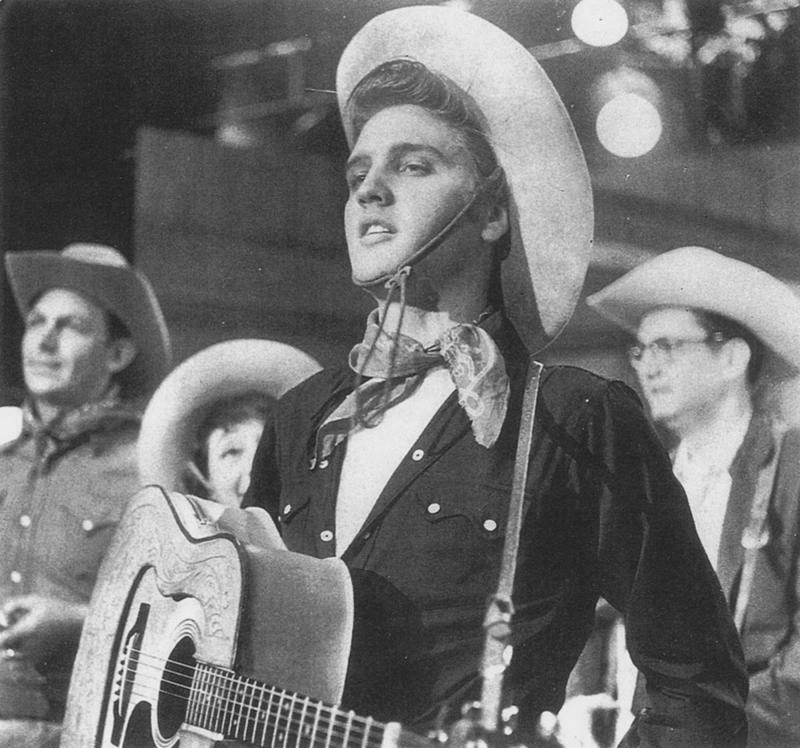 Nudie Cohn’s second creation for Elvis was the famous COWBOY OUTFIT from Loving You. 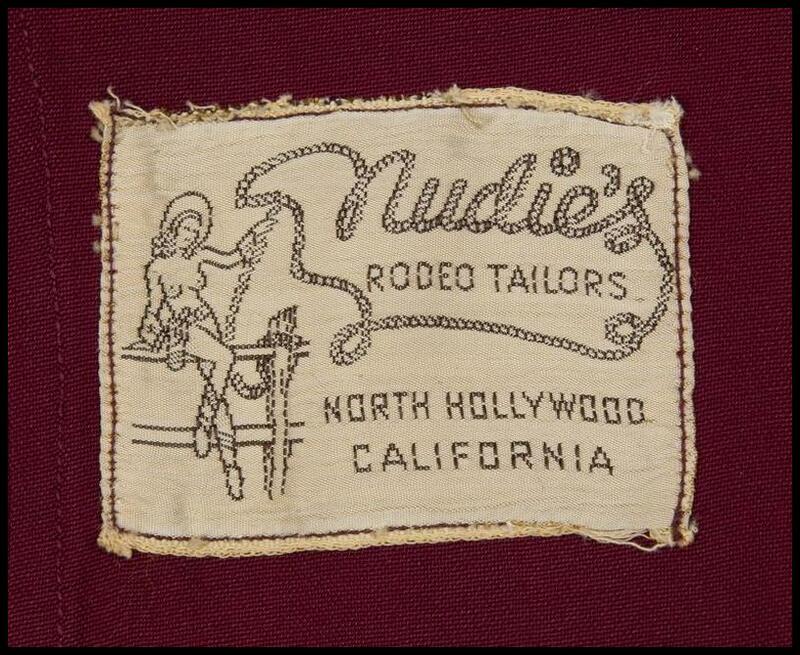 Filming started in the middle of January 1957, so we can assume that Nudie delivered the outfit to Paramount somewhere in late December 1956 or early January 1957 at the latest. 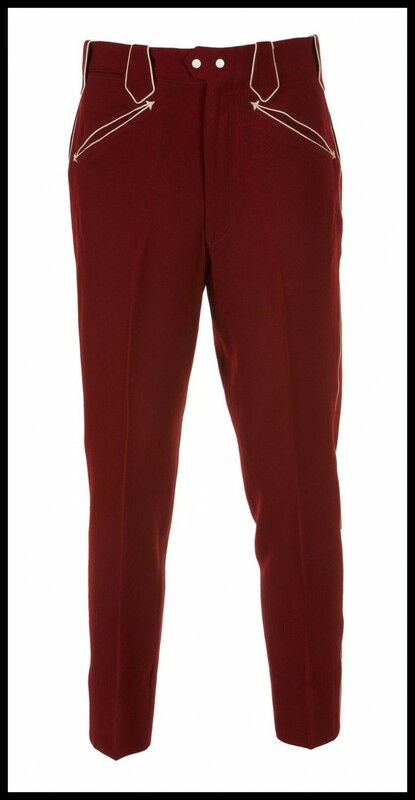 Here we have a pair of back-up pants from the Cowboy Outfit. 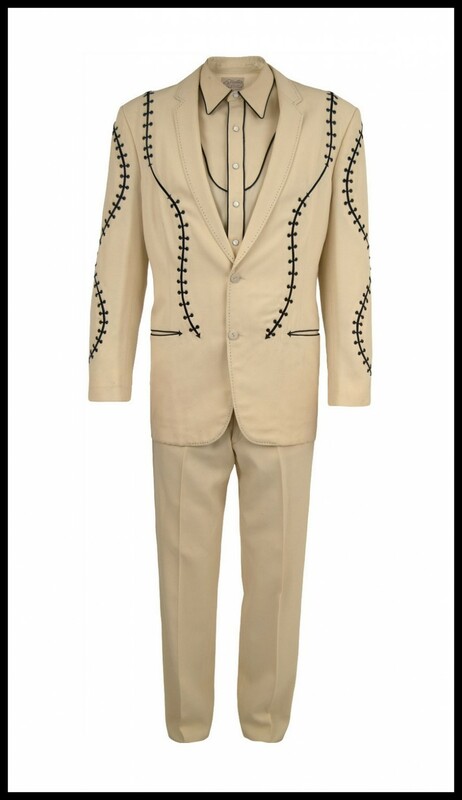 They were not actually worn by Elvis in the movie, yet they fetched a little over $20.000 in auction in 2010. Apparently, the original outfit is in the hands of a private collector. 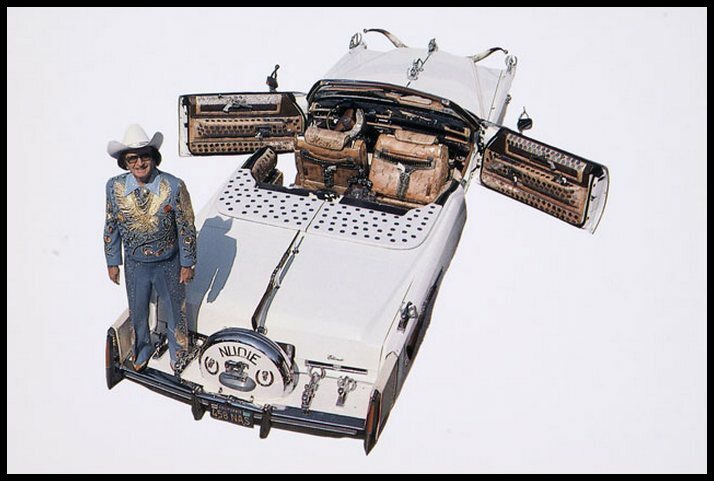 It’s one of those very famous Elvis items that has never actually been seen by the public. 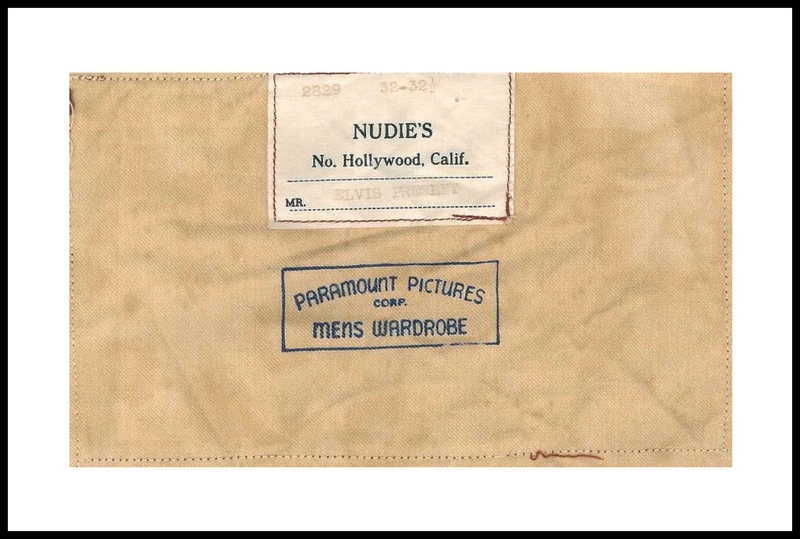 The photo below shows Elvis Presley’s name on the Nudie label, as well as the Paramount Studios stamp. 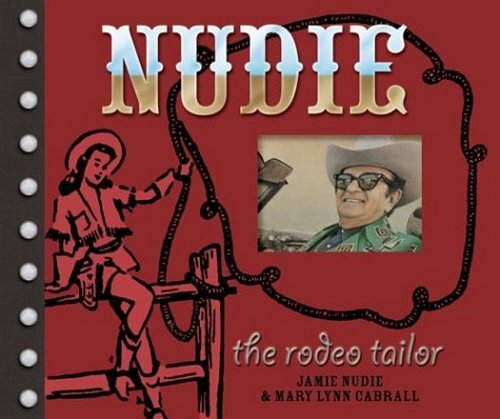 Over the years, many of Nudie’s creations have ended up on (mainly Country & Western) record covers. 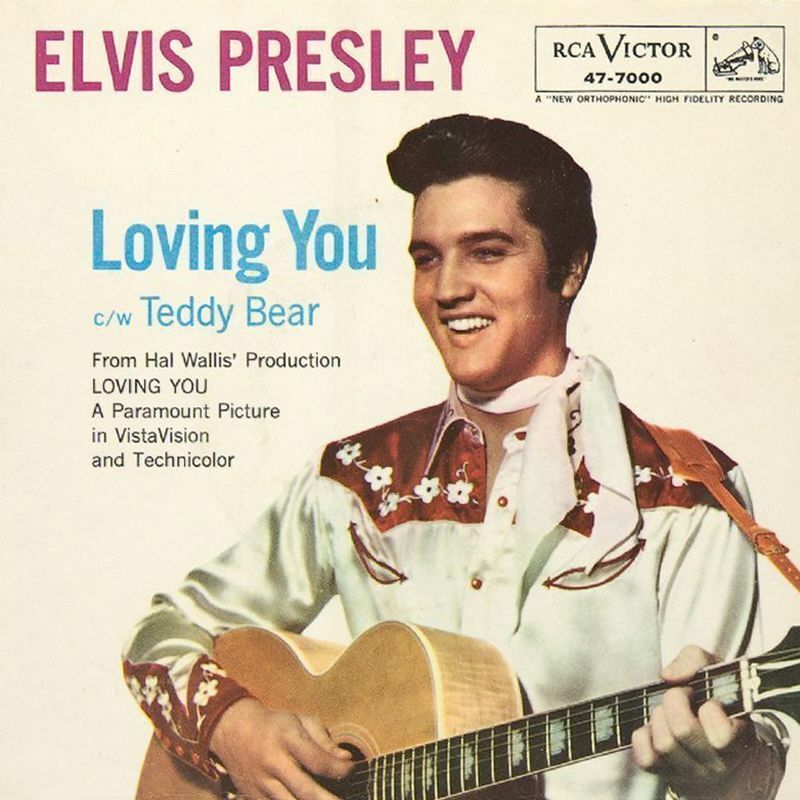 Before the Gold Suit was projectiled to it’s eventual iconic status with the release of Elvis’ Golden Records, Volume 2 in 1959, there was the Loving You / Teddy Bear single, released in June of 1957. The exact date is unknown. 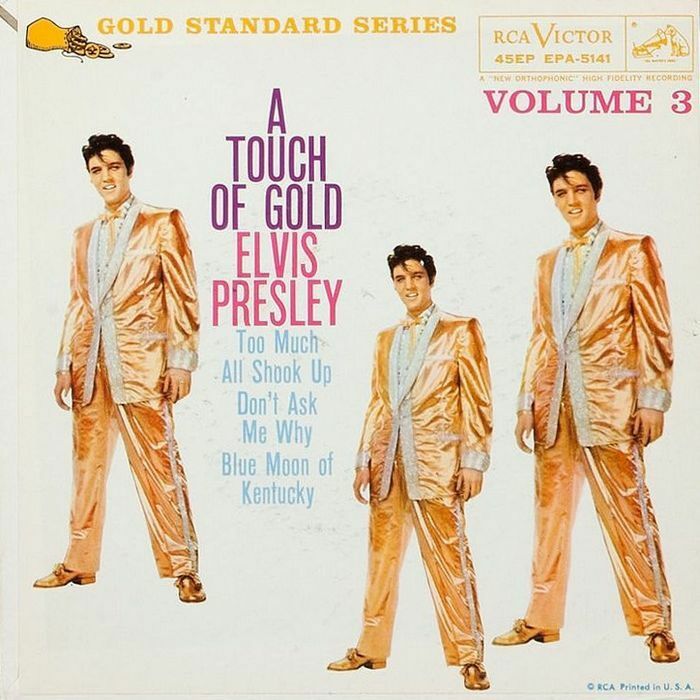 But it is most likely that the Gold Suit Photoshoot took place in the beginning of March 1957. 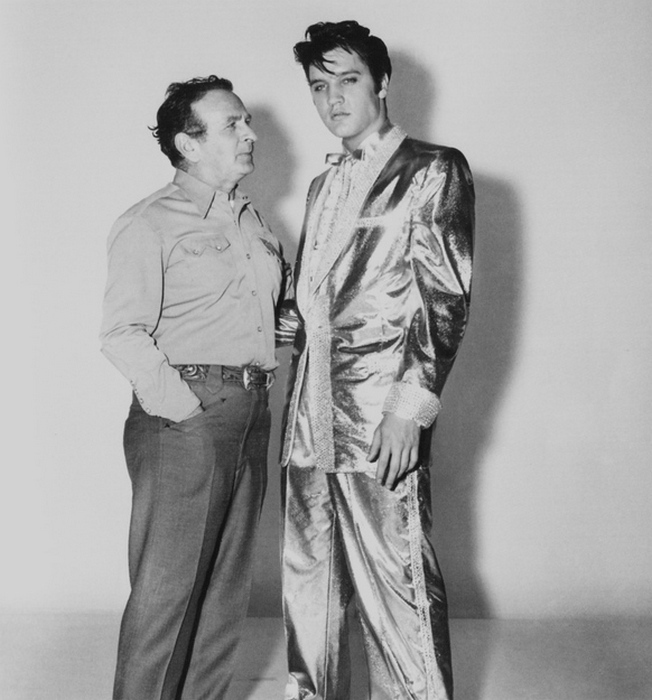 Next to the 2 photos of Elvis with Mr. Cohn, only 7 images of Golden Boy Elvis have seen the light of day so far. But it would make perfect sense that more shots were taken. 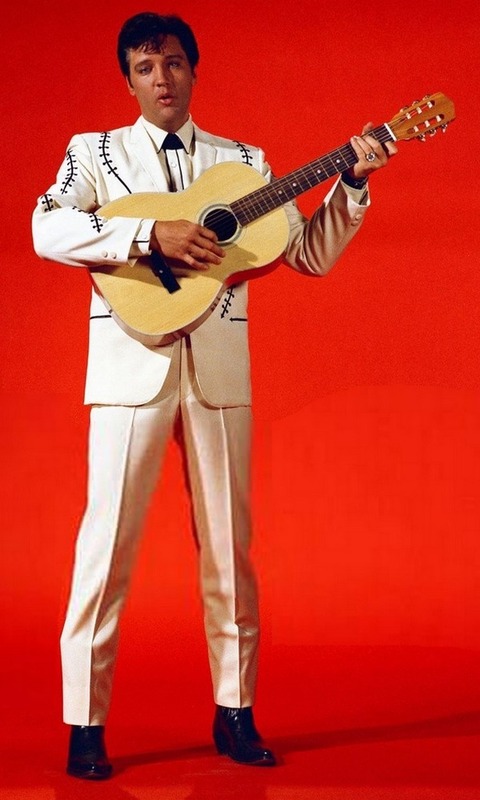 Apart from the truckload of photos that were taken during the live gigs in 1957 when Elvis either wore the complete suit or only parts of it, only 1 other photo seems to exist. 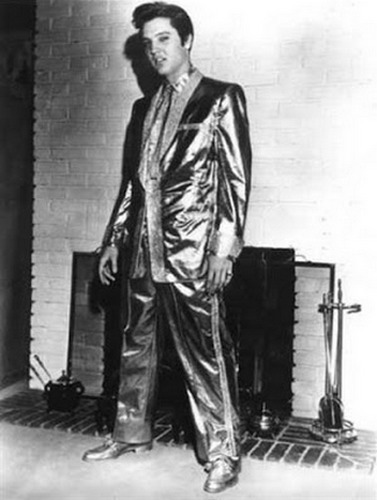 Elvis is proudly posing in his new set of clothes in front of the fireplace at Audubon Drive. The image below is of a much lower resolution, but we also get to see more of the original photograph because it’s also much less cropped. 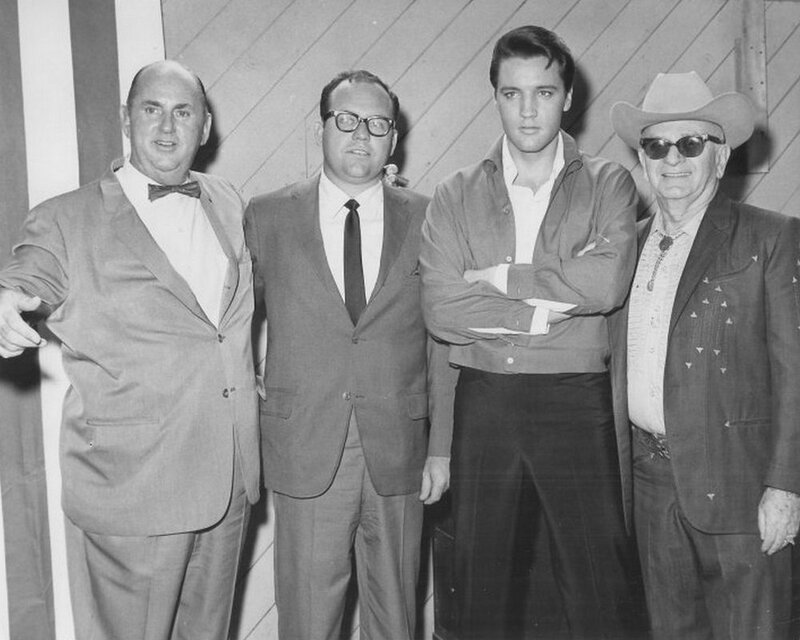 Here is a rare photo of Nudie Cohn visiting Colonel Parker and Elvis on the set of Girl Happy (1965). Next to the 1957 photos of Nudie with Elvis, no other photos of them together exist (at least to my knowledge). 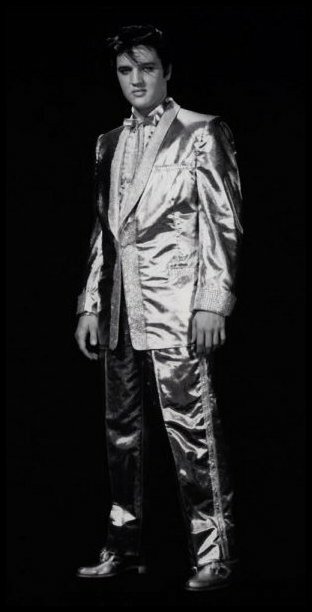 A decade had passed by the time Nudie designed another outfit for an Elvis movie. To the right we can see that Elvis’ measurements have hardly changed over these years. 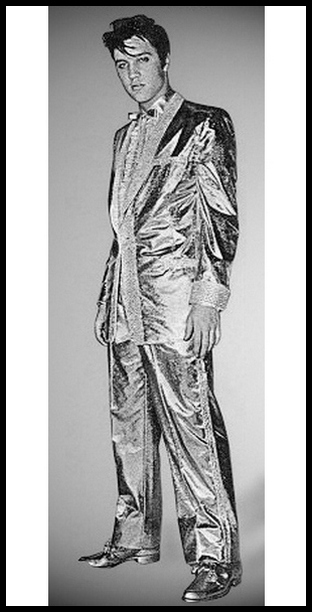 Exactly 10 years after Loving You, Nudie was responsible for the design of the MILLIONAIRE SUIT in Clambake (1967). The Millionaire Suit sold for an incredible $110.000 in 2008. 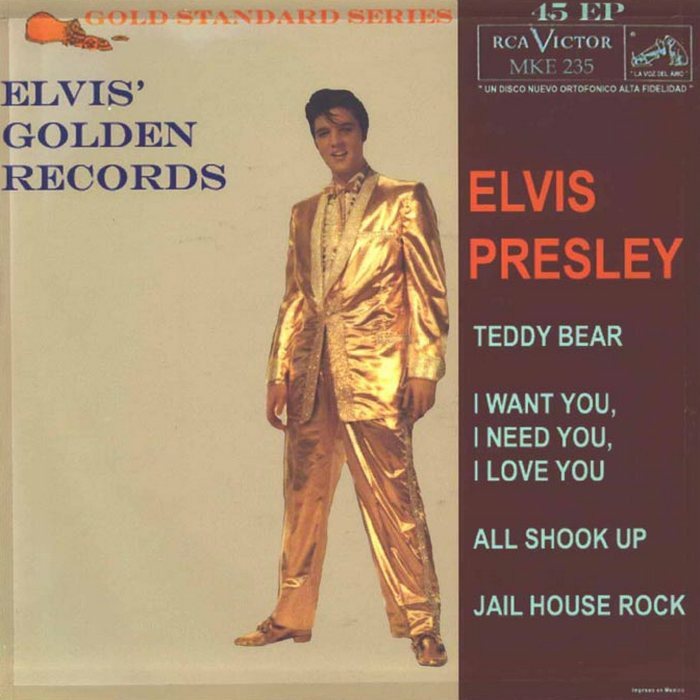 Sure, the Gold Suit is very unique and legendary, and the Teddy Bear outfit is pretty flashy too. 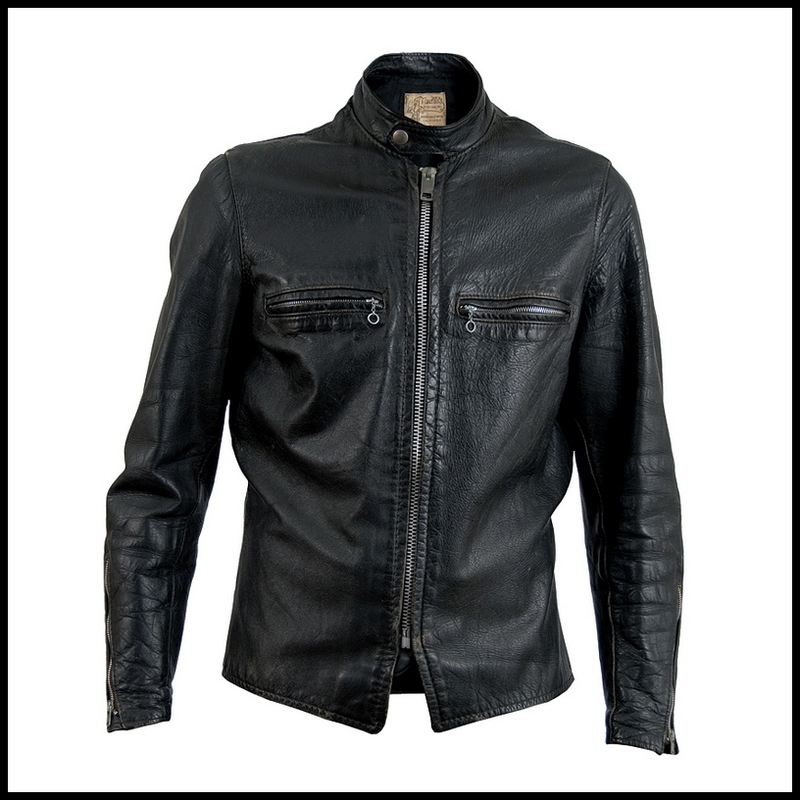 But the coolest piece of clothing Nudie designed for Elvis has to be this BLACK LEATHER RACER JACKET. 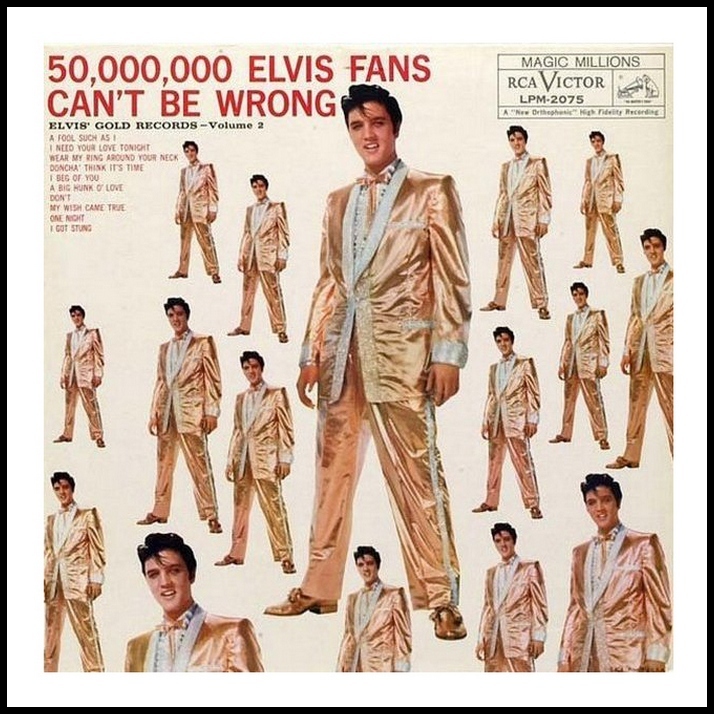 When it appeared in auction in 2009, it became evident that Elvis really must have liked this jacket a lot since it showed plenty of wear, but it fetched $11.500 nonetheless. 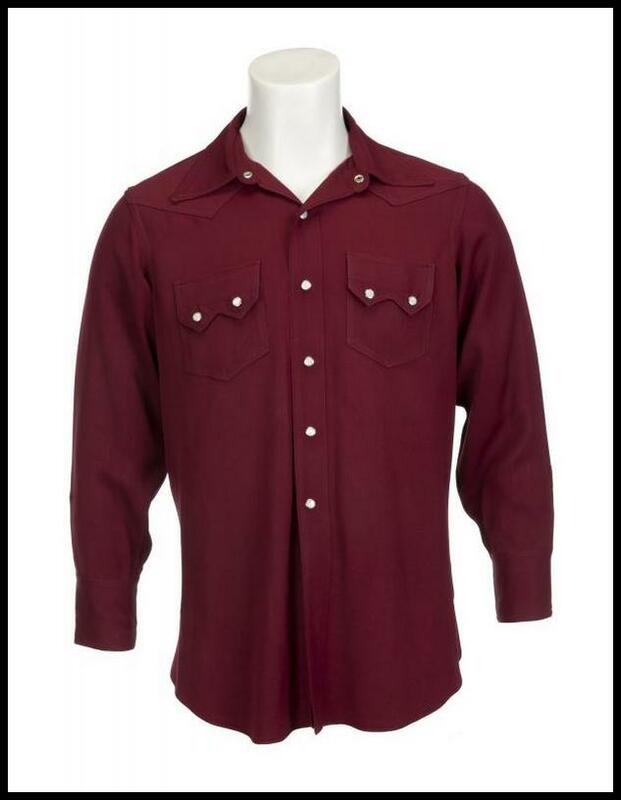 Elvis often wore it when he went horseriding at Graceland. He can be seen wearing this jacket in many of the candids from early 1968. 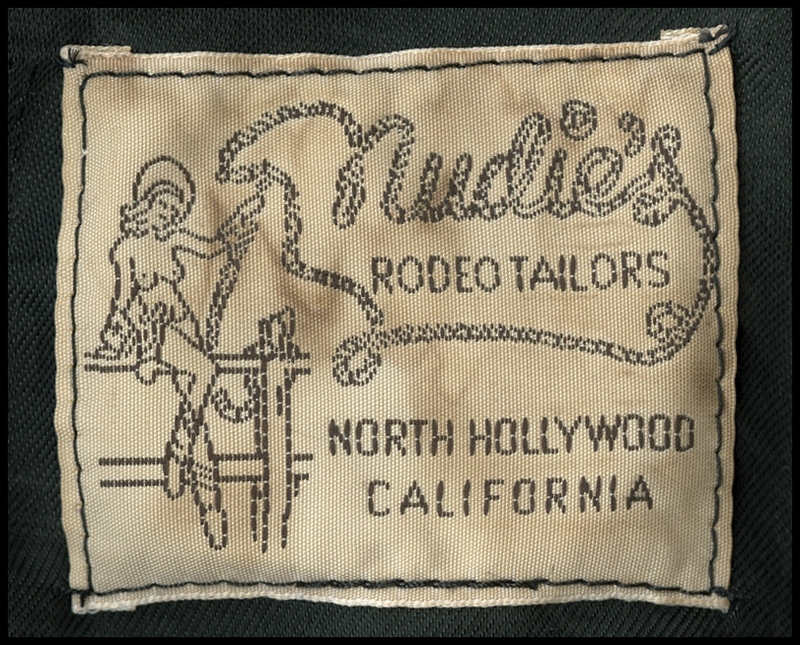 Notice also the label with the naked rodeogirl as opposed to the regular (dressed) rodeogirl in Nudie’s labels. 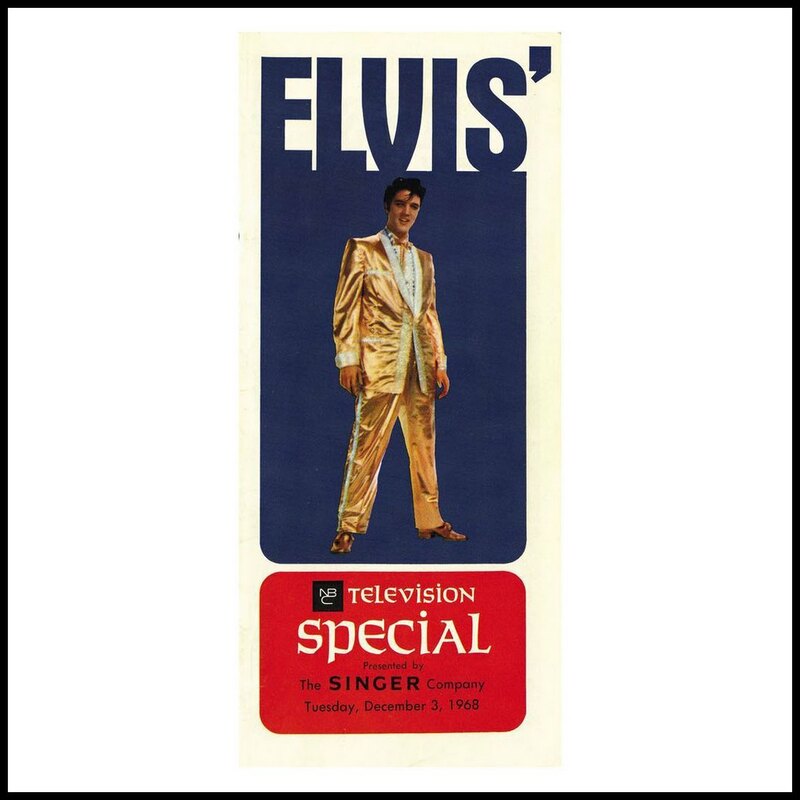 This Promotional Photo (available in two colors) has to be the earliest piece of merchandise that featured Elvis in his Gold Suit. It was produced in two sizes: 8 x 10, and 11 x 14 inch. 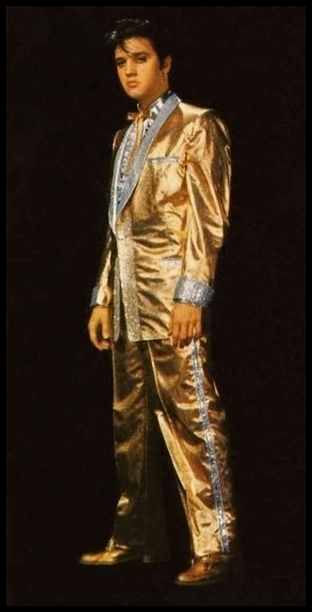 The photo chosen, out of the (at least) 7 different poses, would become the standard and most recognized Gold Suit image. With the exception of only 1 or 2 occasions, this specific photo will grace all feature promotional and commercial products. 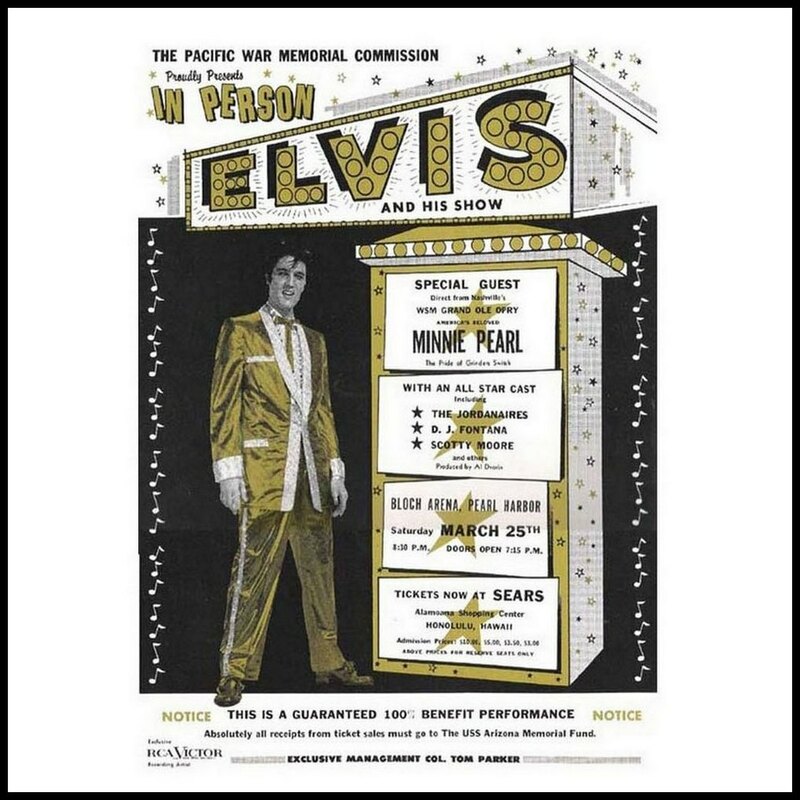 1956 was the year the first wave of Elvis Presley Enterprises memorabilia flooded America. 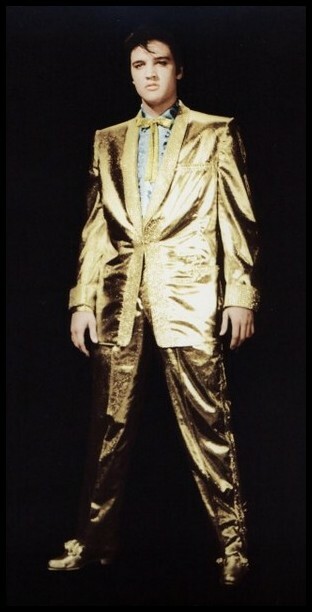 Only one such item carried Elvis in his Gold Suit, which may seem like a missed opportunity at first. But on the other hand, by 1957 the flood had dried up quite a bit and hardly any new items were produced by this time. 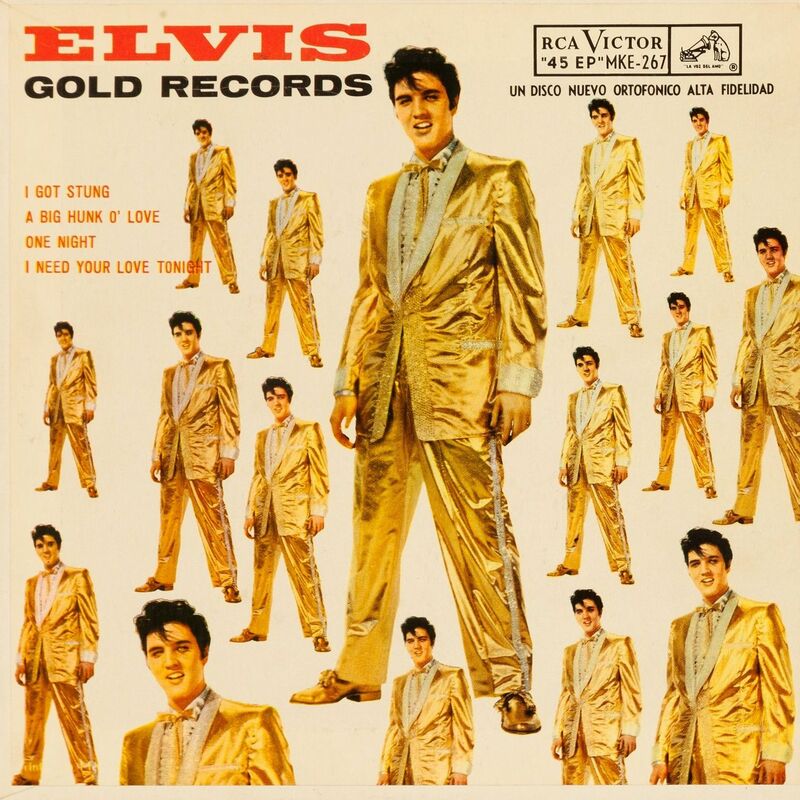 It makes you wonder, that if Parker had started EPE in 1957 and not as early as 1956, that the Gold Suit would have been the image portrayed on some 40 or 50 different pieces of merchandise instead of the photo that was also used for the cover of Elvis’ first LP. Probably so. 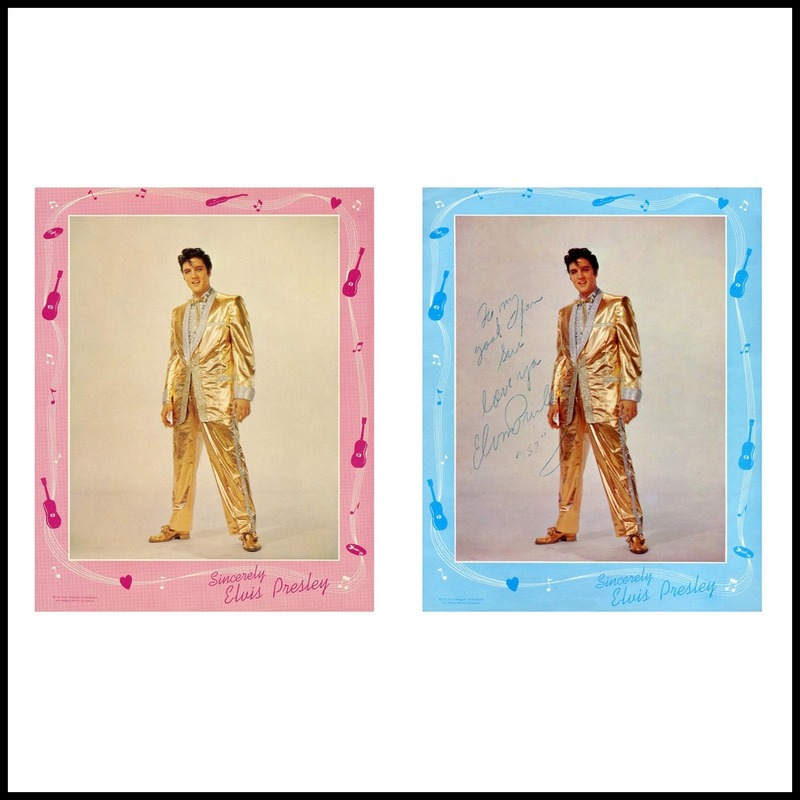 The photo with the blue frame is personally signed by Elvis. 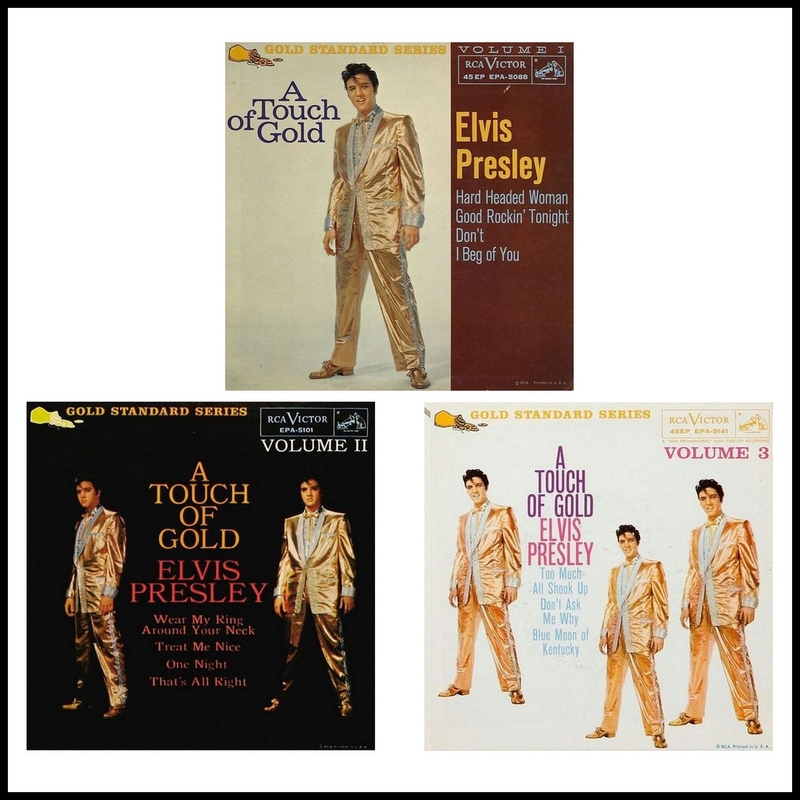 The first time the Gold Suit was used on a Presley record, was on Volume I of the Touch Of Gold trilogy. 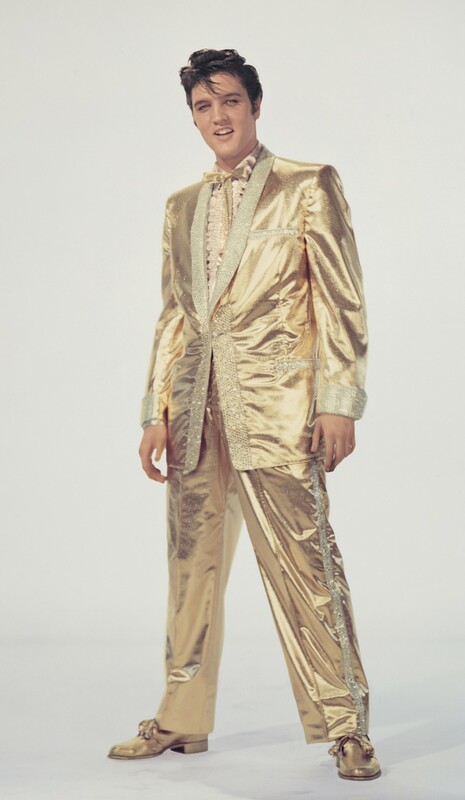 For Volume I, RCA chose the most striking photo from the Gold Suit Photoshoot. And for Volume II, 2 different photos were chosen, which seems logical since enough different poses were at hand. But for the 3rd Volume in the series, RCA returned to the already used image from Volume I. Why? 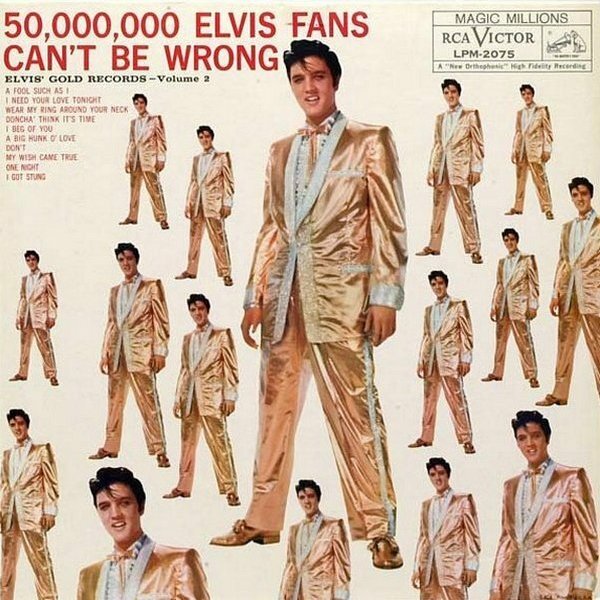 It’s especially interesting to realise that in between the releasedates of Volume II and Volume 3, 50.000.000 Elvis Fans Can’t Be Wrong was released, and this album of course also featured the same photo. 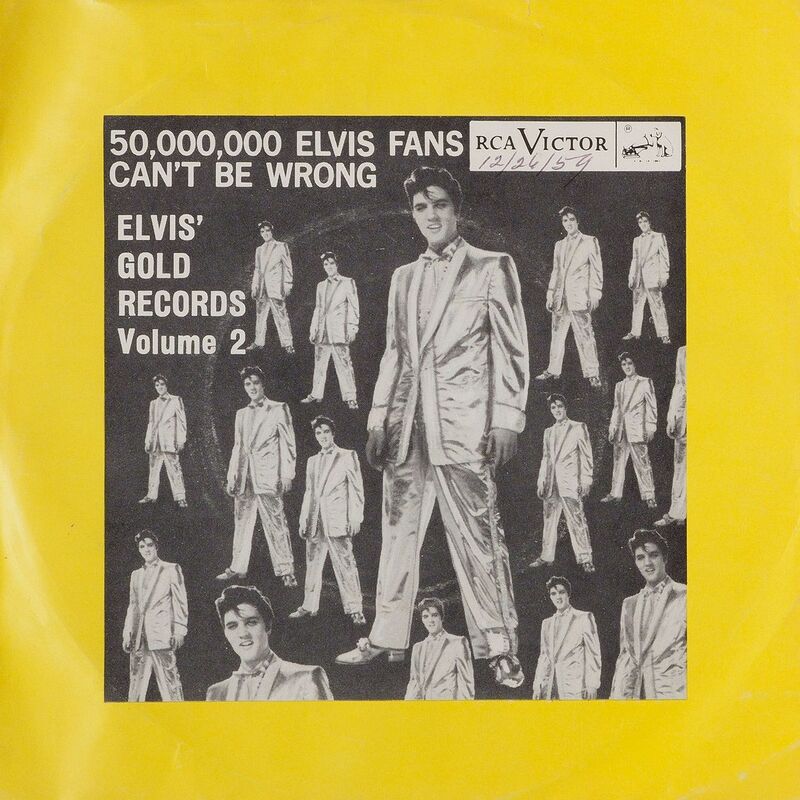 Well, here we have it, 50.000.000 Elvis Fans Can’t Be Wrong – Elvis’ Gold Records, Volume 2, one of the most iconic record covers ever. 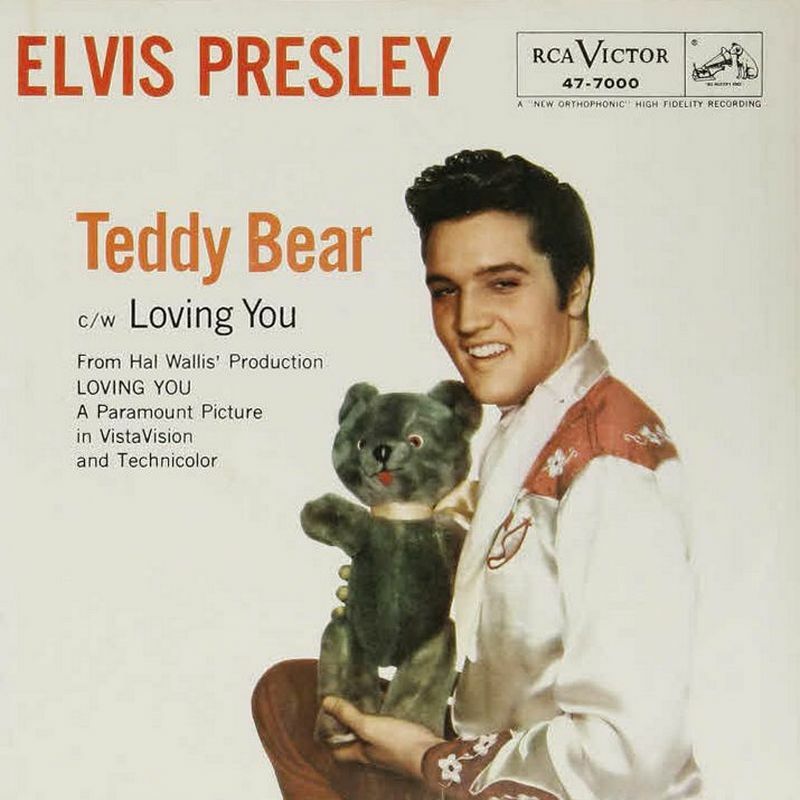 Although a photoshoot was done in May of 1959 in Germany, RCA chose a 2,5 year old photo of Elvis to grace the cover of this album in November 1959. And this turned out to be an excellent decision. 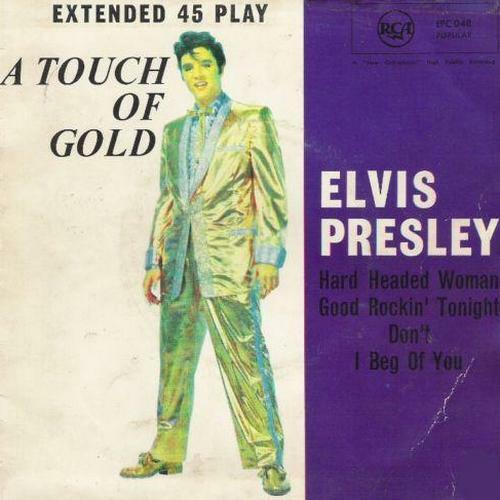 Has anybody ever noticed the size of Elvis’ righthand thumb? 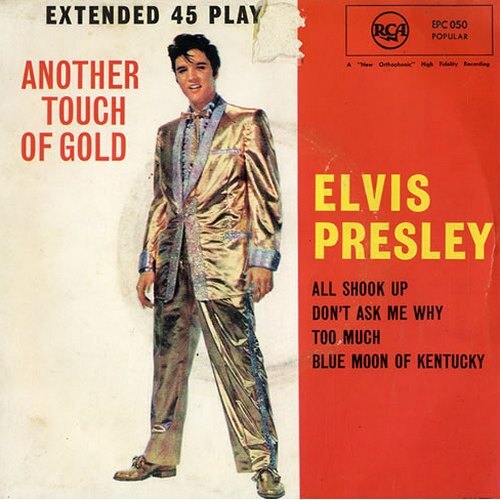 After the release of the smashing Elvis’ Gold Records, Volume 2 album in 1959, the image of Elvis in his Gold Suit had instantly become one of the most iconic and easily recognized photos of any artist ever. 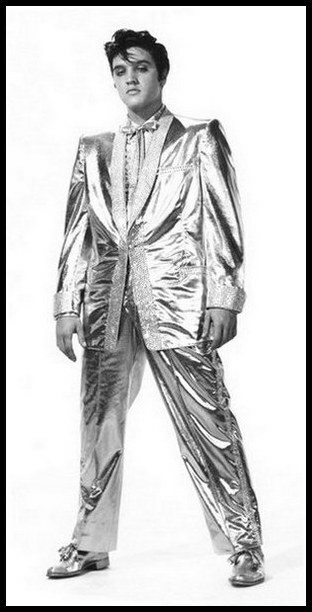 So it makes sense that Elvis’ management chose to use this image for the promotion of the Charity Shows in 1961. The image on the Handbill to the right is of course reversed. 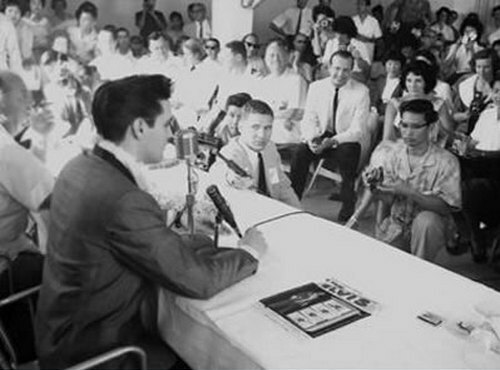 The photo below is from the March 25, 1961 Press Conference, and on the table we can see the handbill that is shown here. Here we have a page from the Picture Folio that was given away for free with the purchase of the Elvis’ Golden Records, Volume 3 album. For the second (and also last) time a different than usual image was used for this ad. 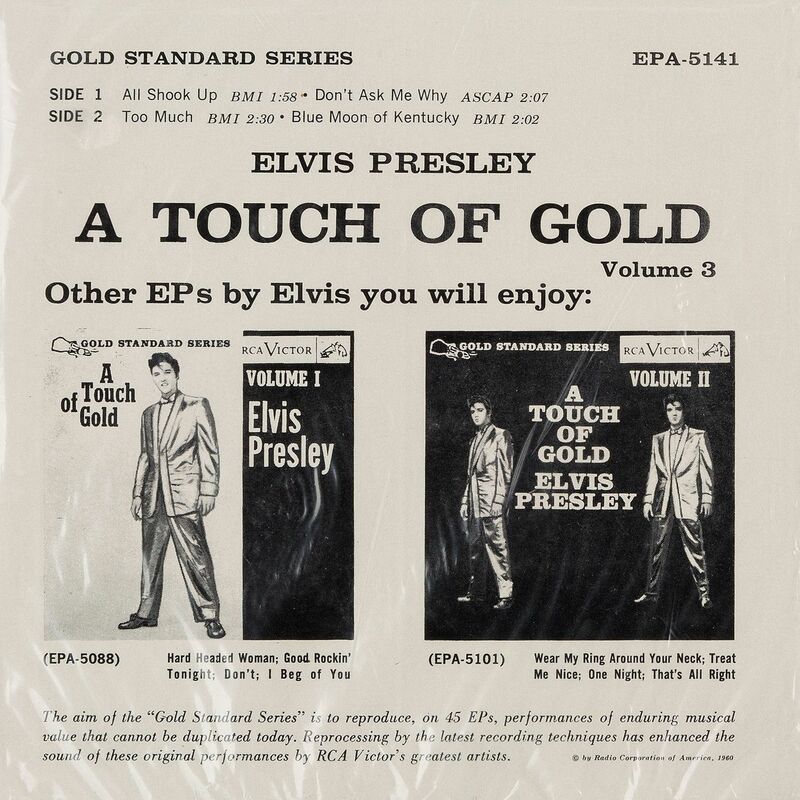 This photo was first seen on the cover of the A Touch Of Gold, Volume II EP (the left image). From the November 30, 1968 issue of Billboard magazine, comes this Fullpage Ad. Just like was done in 1961, one of the most easily recognized images of all time was chosen to promote the Elvis Presley product. But by this time the image was already over 11 years old. The soundtrack for the upcoming TV Special is being advertised here, as well as the TV Premiere of the NBC Special itself on December 3rd. 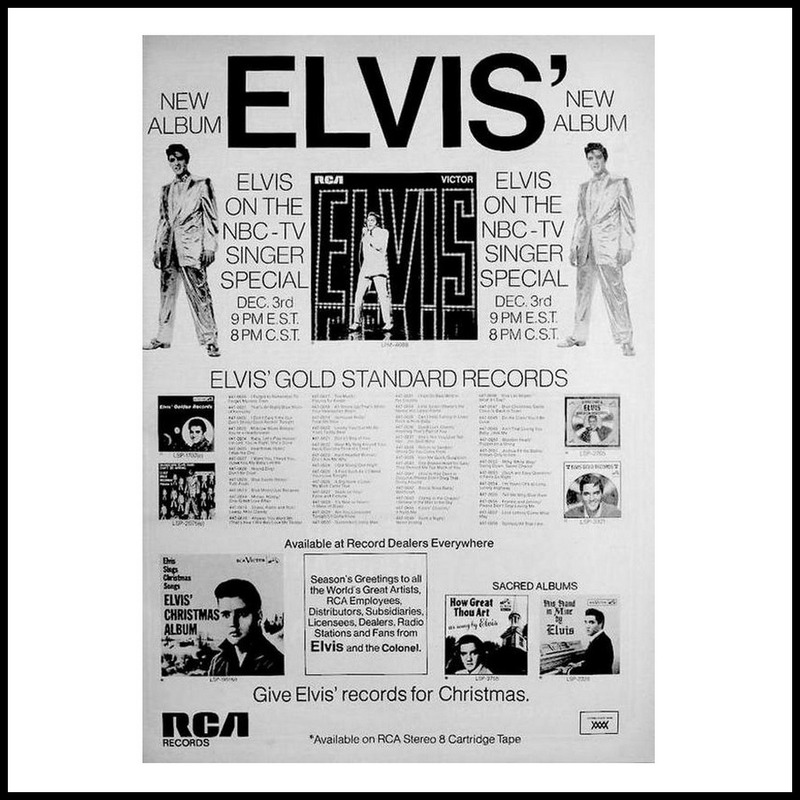 And with the month of December coming up, RCA took full advantage of Elvis’ careerboost by advertising the rest of their Presley catalog with special attention for Elvis’ Christmas and Gospel releases. Here we have the Promotional Booklet for the NBC TV Special. 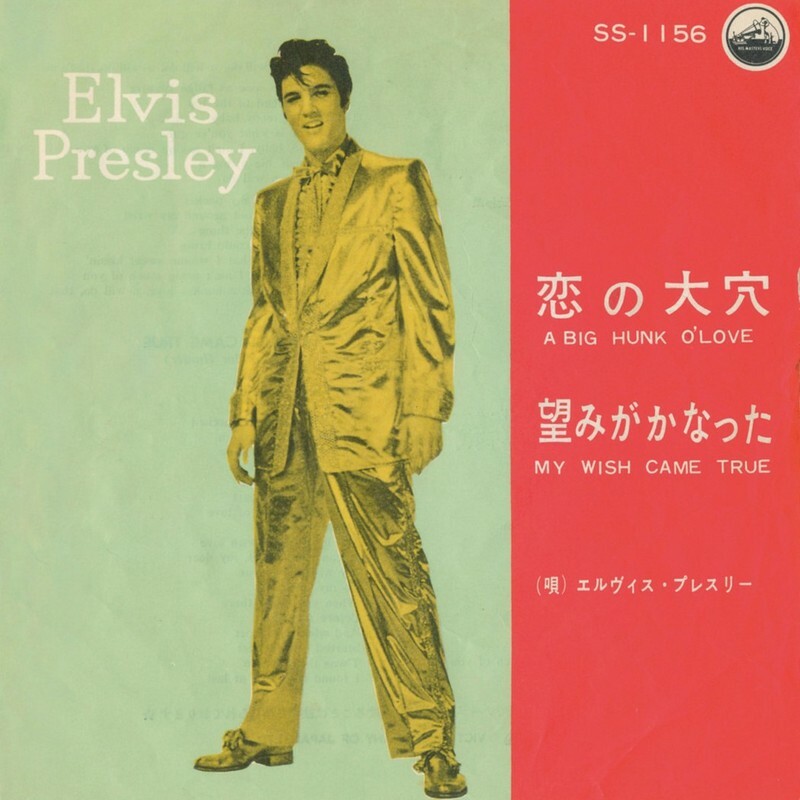 Even though a photoshoot had been done as recent as June of 1968, the image chosen for the frontcover of the Booklet was yet again the most wellknown (but reversed) image of Elvis Presley instead of the ‘new Elvis’. From 1968, a Tabletop Standee that was used to promote the NBC Show in record shops. These standees were made out of heavy cardboard, and they are extremely rare nowadays because only a small amount were produced and more often than not thrown away by the store owner after a while. 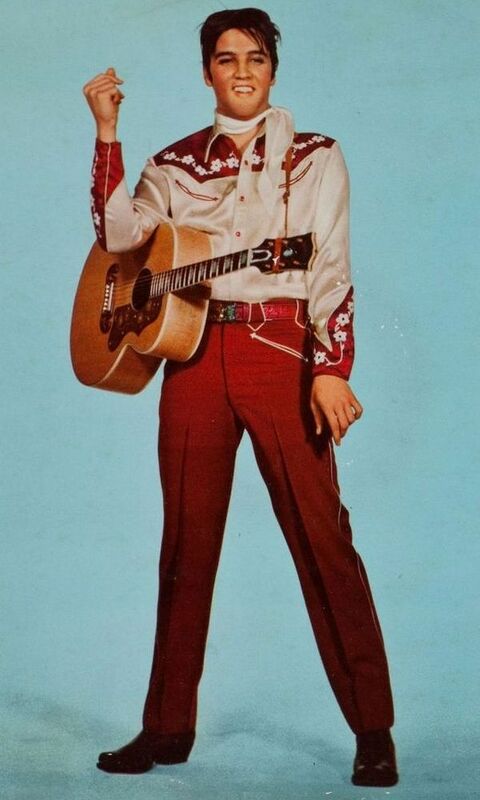 This specific standee has to be rarest of them all since it is personally signed by Elvis. 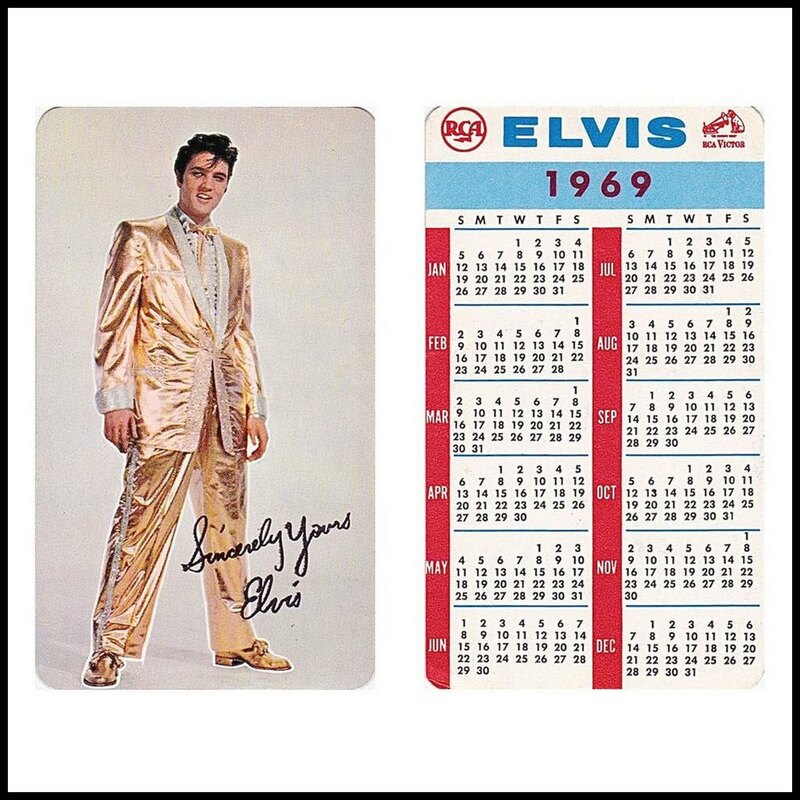 Printed in 1968, also next year’s Pocket Calender featured the wellknown Golden Boy. This nice release from Argentina featured the same artwork and the same songs as the US EP. But it had a different title. RCA Mexico borrowed the US artwork, but they changed the title and coupled 4 different songs for their EP, making this a unique to Mexico release. You can always count on the Japanese to do something different. The cover chosen for this single is no exception. RCA South-Africa kept the songs and most of the artwork in tact, but they omitted the ‘Volume 1’ subtitle. This follow-up release to South-Africa’s A Touch Of Gold EP actually features the songs of Volume 3 of the original US series. The most noticable thing about this EP is that the titlesong was already present on Another Touch Of Gold. The second Volume in the series, also released in Germany, Italy and the UK. 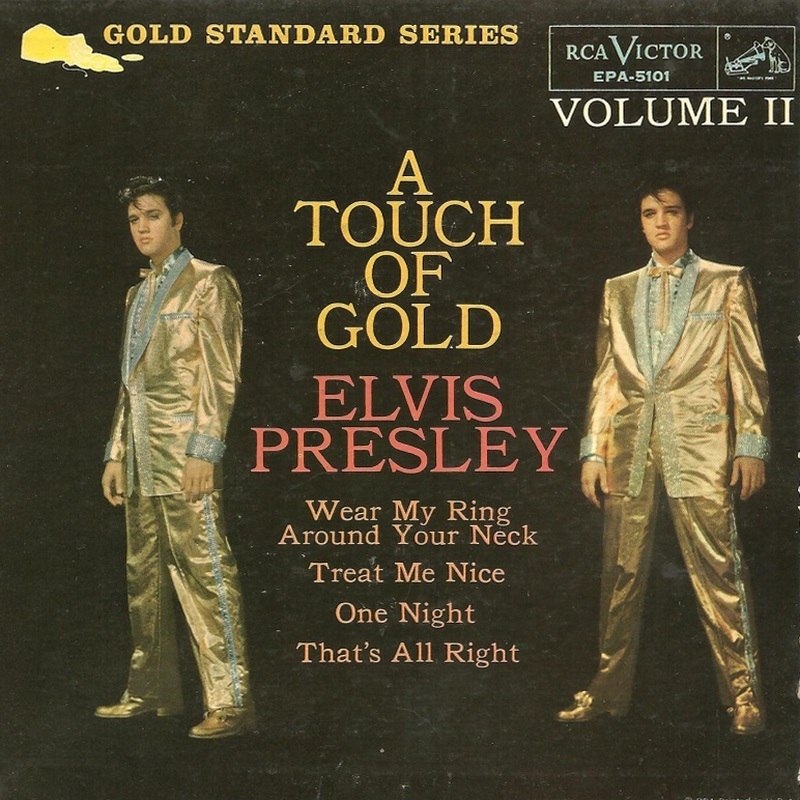 Japan was the only major country that did not release the A Touch Of Gold EP series. 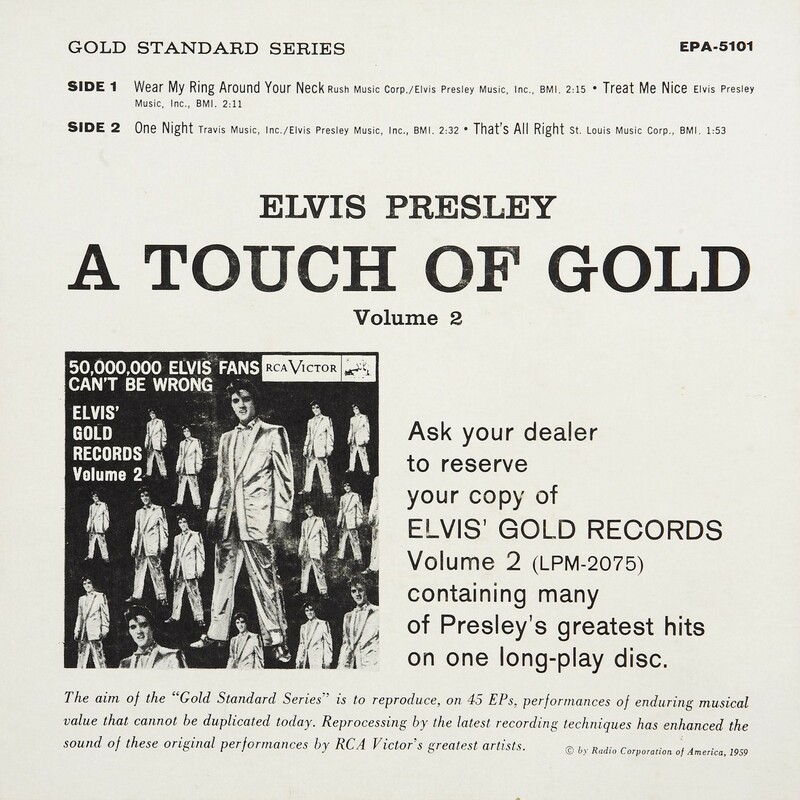 They did eventually release Volume 2 in the 33 RPM format, but this was not until ’65 with the title changed to Wear My Ring. The final Volume in the trilogy, also released in Germany, Italy and the UK. 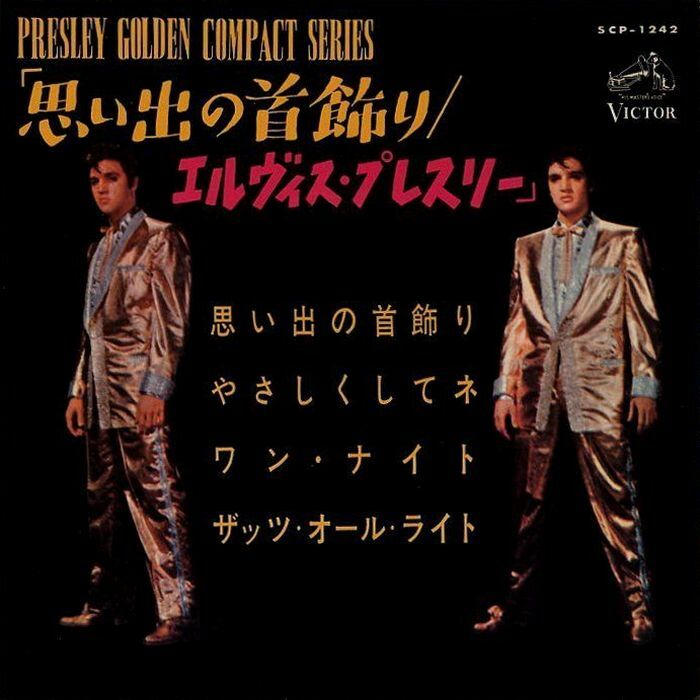 Only one year after their release of Elvis’ Golden Records, RCA Japan released the similar titled Elvis’ Golden Record. This 10″ LP consists of 8 out of the 10 songs on LPM-2075 (omitting Don’t / I Beg Of You). 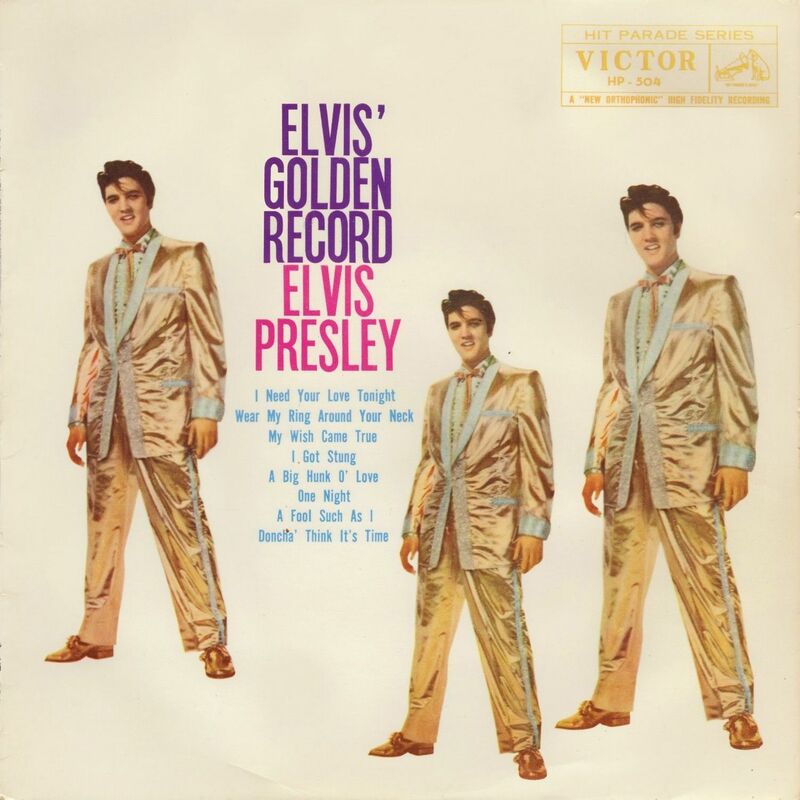 Elvis’ second Golden Records LP from 1959. To the left we see the Spanish pressing of LPM-2075, for which a different title was chosen. 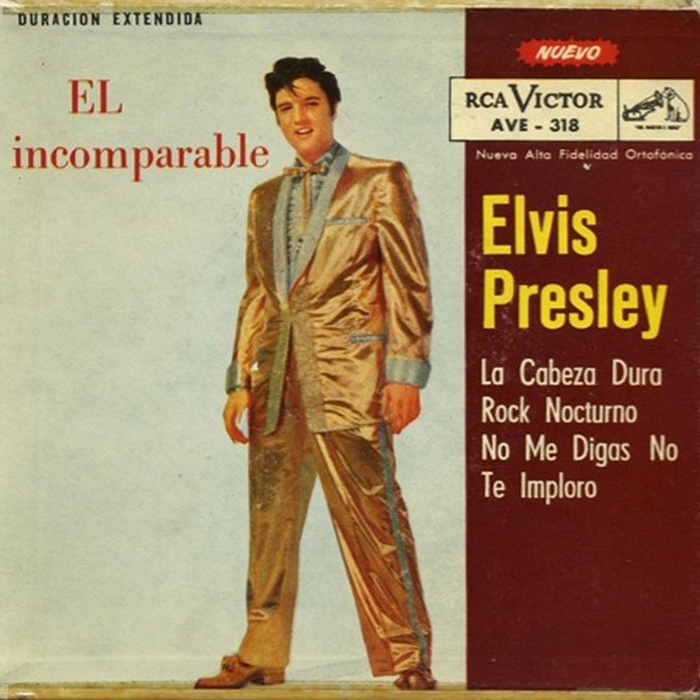 The exact same cover/title was used by RCA Mexico. However, this is not a full album but a 4 track EP. 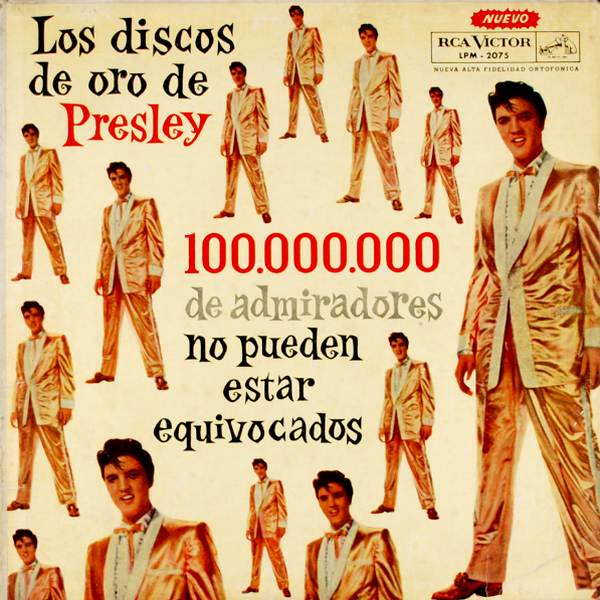 This LP has a different lay-out and the amount of Fans has miraculously doubled from 50.000.00 to 100.000.000! A nice 45 from the land of the risng sun. We end our GOLD SUIT DISCOGRAPHY with this ultrarare 2-Track Promo single. 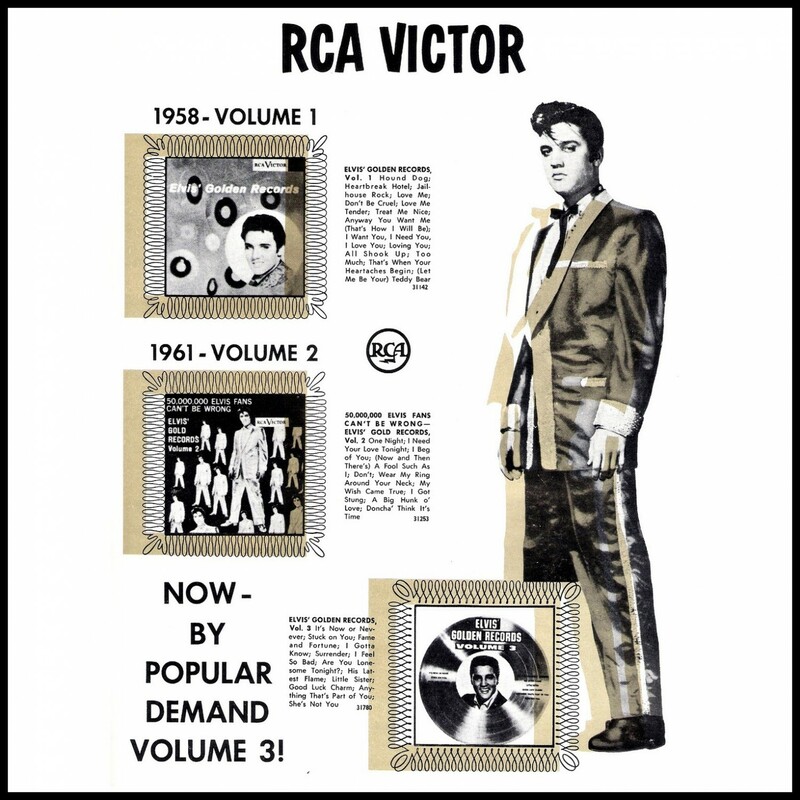 For the cover-art of this 45, RCA Victor had chosen ‘the b&w background version’ of the album cover that showed up in magazine advertisements around the time of release of LPM-2075 (as well as on RCA releases). 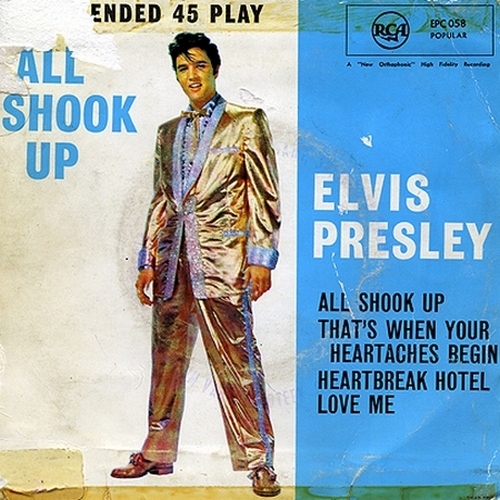 It is possible that RCA’s Art Department at one point considered a black background for their latest Presley album. For the sake of completion, here are the backcovers of EPA-5101 and EPA-5141 (A Touch Of Gold, Volumes 2 and 3). These backcovers show LPM-2075, EPA-5088 and EPA-5101 with what are often referred to as ‘alternative covers’, fueling the idea that these records must have been released with different frontcovers. Even though a black background may have been considered for LPM-2075, alternative covers for these releases do not exist. 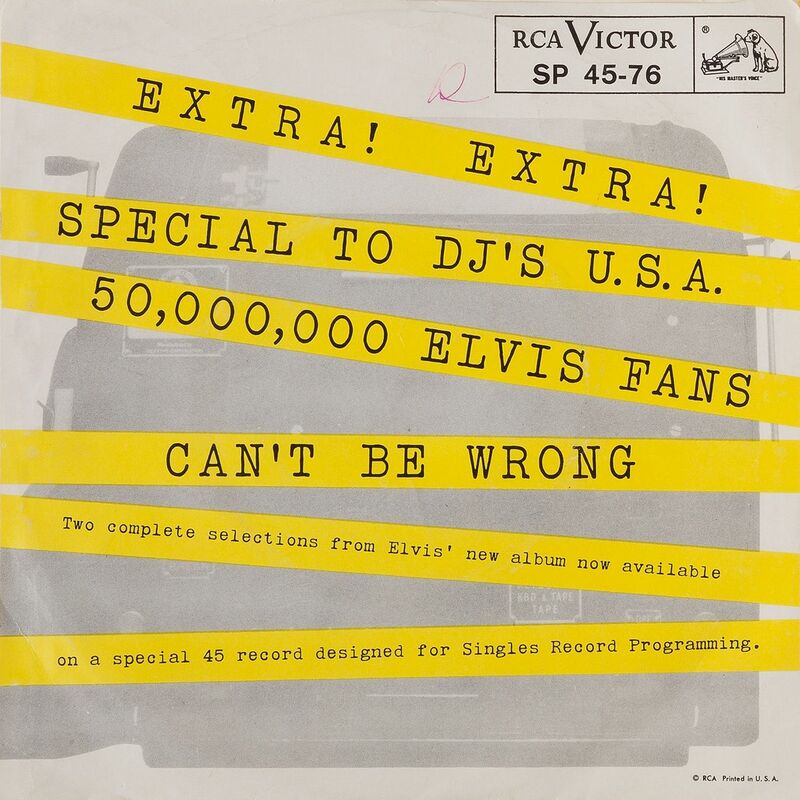 It was very common for RCA to promote their releases in stripped down b&w versions on both RCA records and in magazine advertisements. To Dennis Berry for helping out with a scan of the page from the 1963 Picture Folio. And to Joe Spera and Geert Hof for correctly dating the 1968 Tabletop Standee. 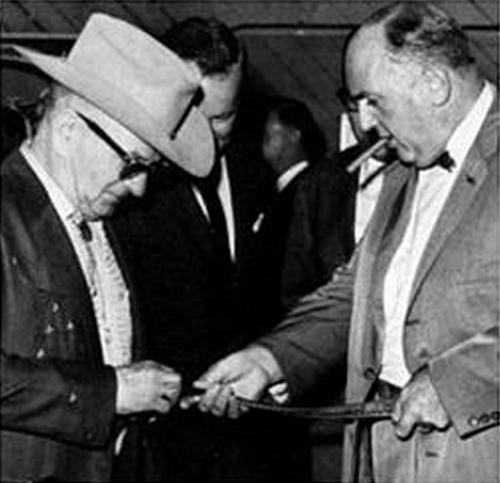 Nudie’s grandaughter, Jamie Lee Cohn, has published the book about her famous grandfather that is shown here to the right. 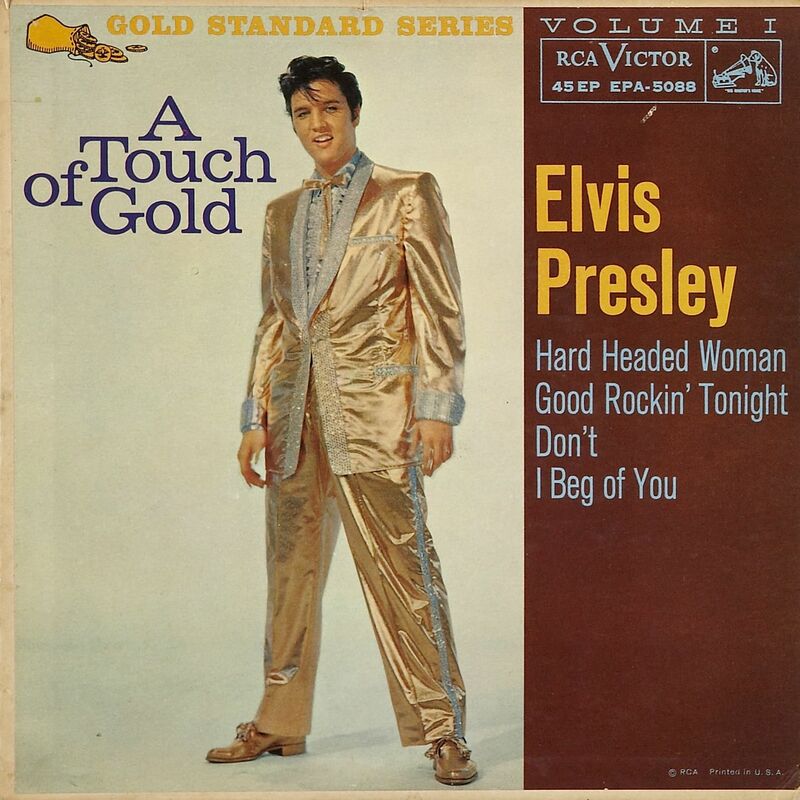 ON THE ROAD with the Gold Suit … SOON ON ECHOES! Oh, wow what a wicked post!! There’s nothing quite like thorough, well organised research. Very, very, very well done. Thank you! Dat was een bult werk, Bob! Tof onderwerp, prachtige presentatie! A fascinating article — well done! That’s just great! Thank you! Excellent job Bob! Just great. Great article, many thanks and well done. Some great photos here, some that I hadn’t seen. Fantastic photos and a very good article. What a first class article. 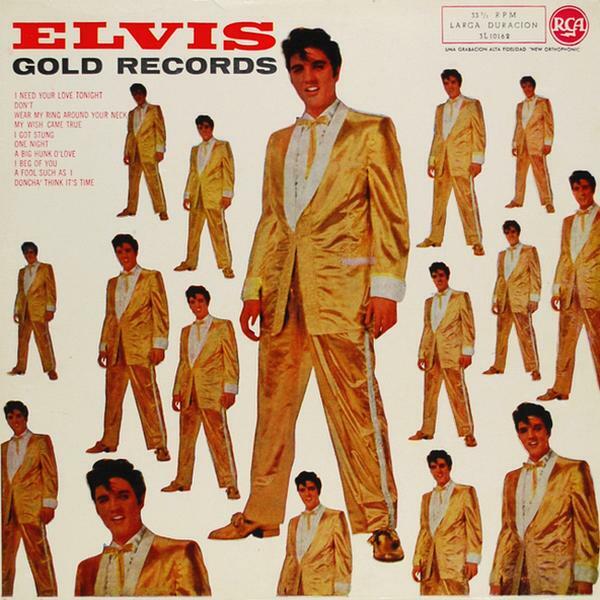 Now can’t wait for `on the road with the gold suit` soon on Echoes. This was great … interesting that the black leather jacket from ’68 had one of Elvis wood tipped cigars in the breast pocket. You have redefined the word ‘comprehensive’, Bob ! Fantastic! Your work is very much appreciated. Thank you! One thing puzzles me. 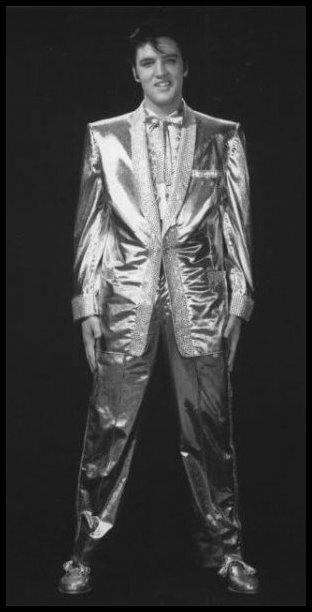 I was always under the impression that the Speedway suit was cut up for use in the box set as a swatch of cloth. 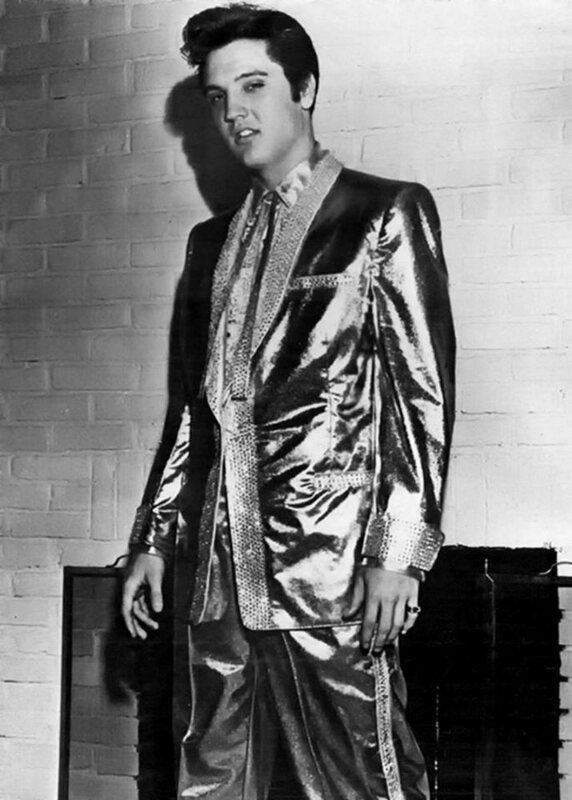 Obviously the RCA top brass kept a hold of some of the clothes that Elvis delivered. There is a photo of RCA president Roco Laginestra trying the jacket on prior to everything being cut up. Quality artice, hugely enjoyable and informative, thank you. Brilliant job as always Bob. 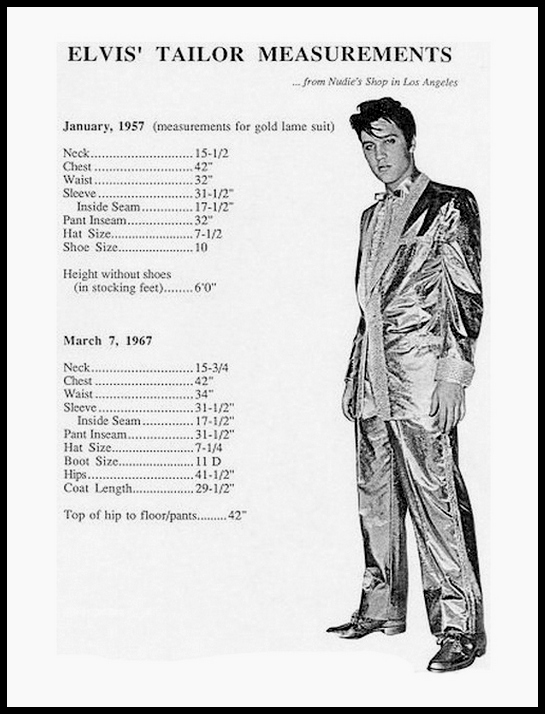 Probably the most comprehensive article about Elvis and his Gold Lame Suit. Well done. Much appreciate the effort. I love the fact that Uruguayan version was 100 Million fans. What a find. Great work, Bob!! Many pictures I’ve never seen before… brilliant article!! Awesome, thank you so much for your time and efforts in this GREAT post of the Gold Lamé. Excellent! Superb topic! Congrats with this new highlight op this website! 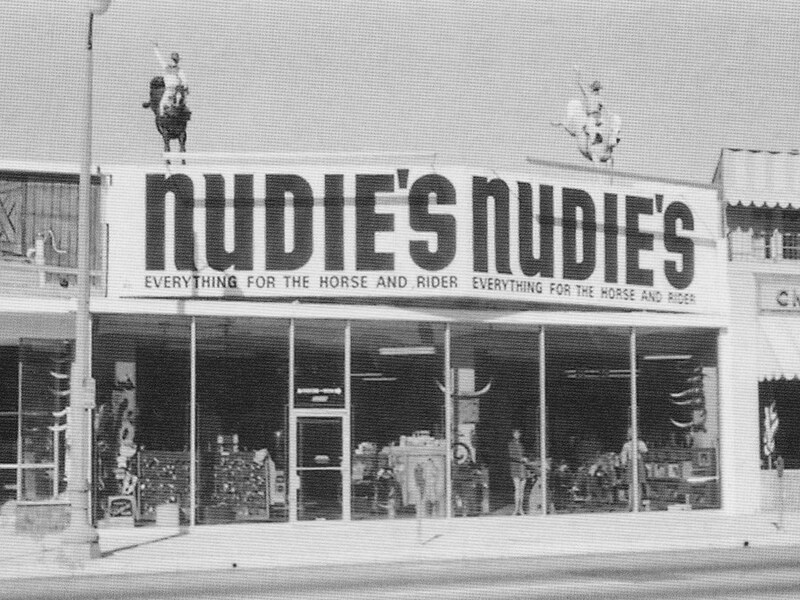 I don’t know how long it ran for but there was also a Double Sided Letter/Flyer called Nudie’s News – I have the 1st one Vol 1 – No.1 from May 1956, which reports on Nudie & his daughter going to see Elvis in Vegas, it also has a nice pic of Nudie, Barbara & Elvis together that I don’t think has been printed anywhere else. A little correction: In Germany only The EPA 5088 was issued by Teldec! Vol.2 and Vol.3 never issued in Germany! !